Built from 1992 till 1994 (own Plan and building own retracts included). 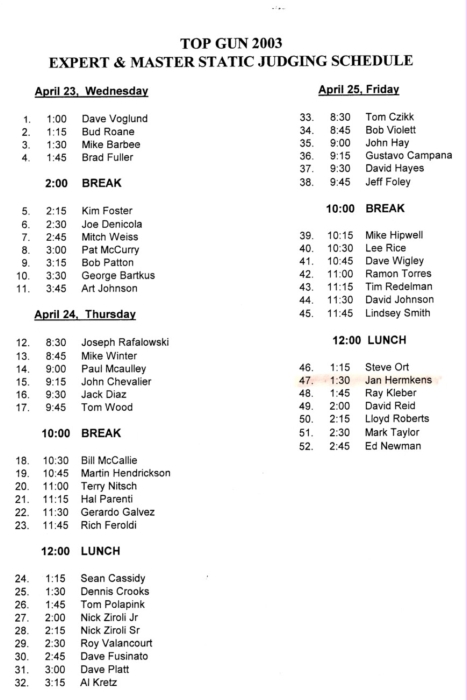 Flown from 1994 till present. 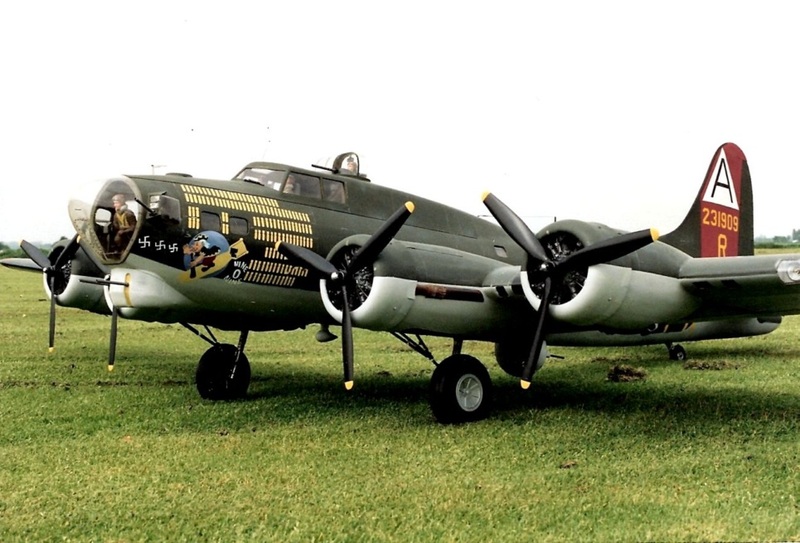 My love affair with the American Bomber B-17 Flying Fortress began many years ago. 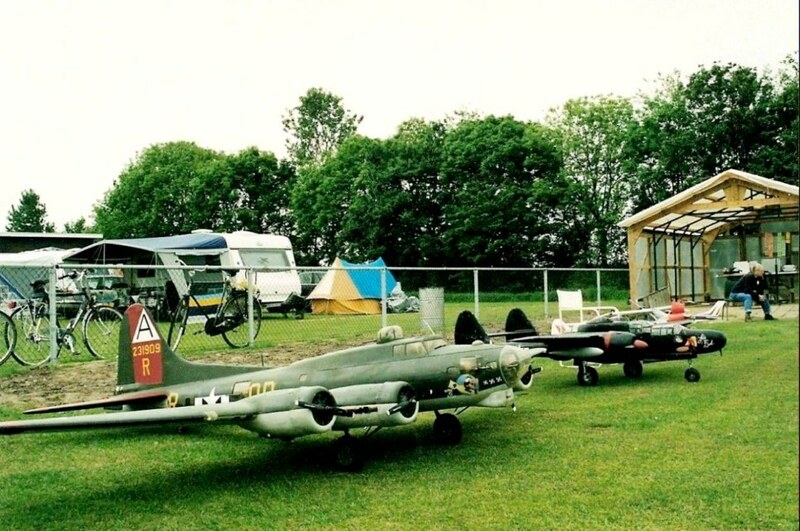 As a teenager ,building and flying free-flight gliders in the early sixties, I dreamed that I would build some day a large Flying Fortress. 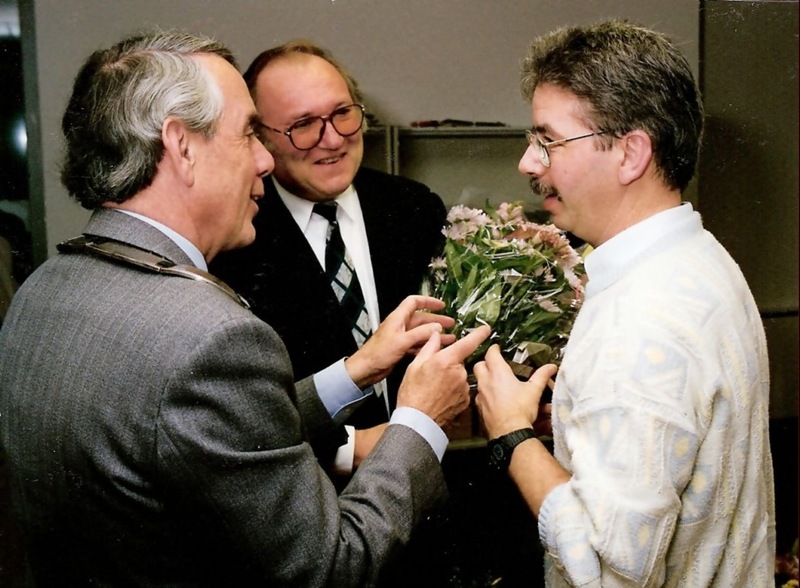 At that time it seemed like an impossible dream, but it was just a matter of time. (span 3,17m.= 10 feet), from my own plan. 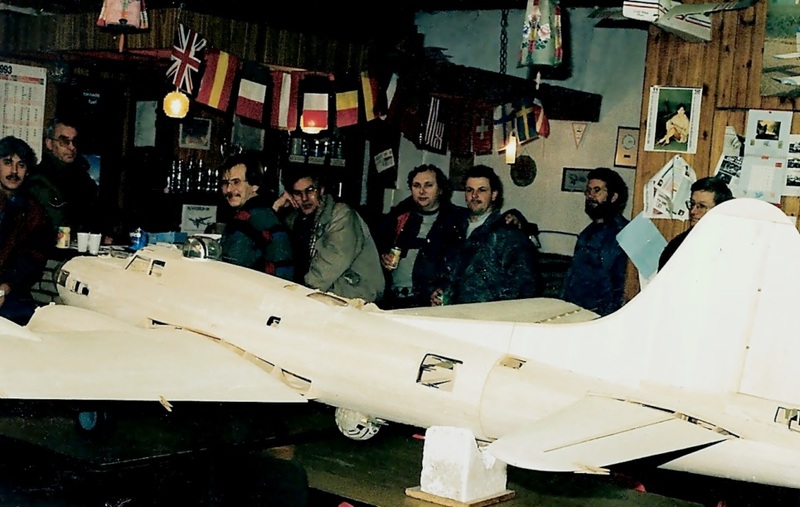 She had her Maiden flight in June 1983 and after many flights and winning a lot of large Scale and Stand-Off Scale Competitions, (among them National Championships) the model crashed in July 1987, after a radio failure. 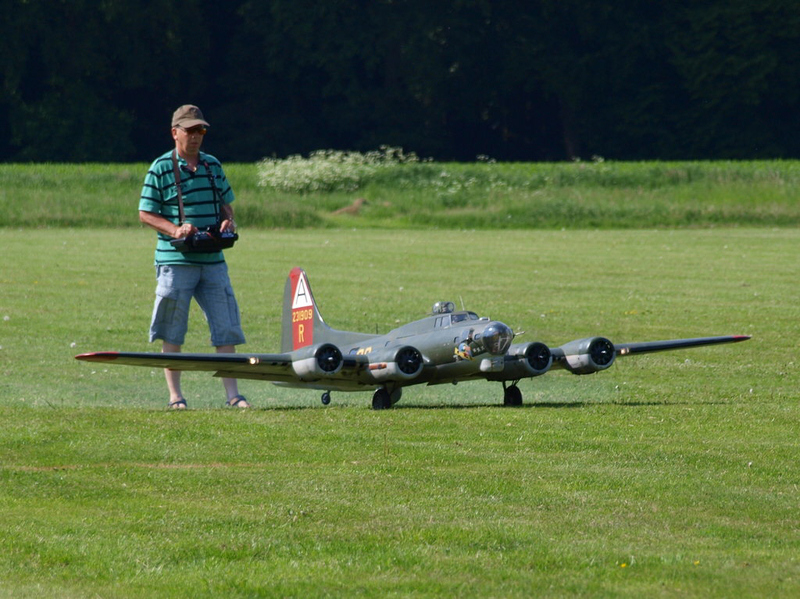 I chose once more, the B-17, but now a little bit larger, scale 1/8th (1:8) (span 4m.= over 13 feet). 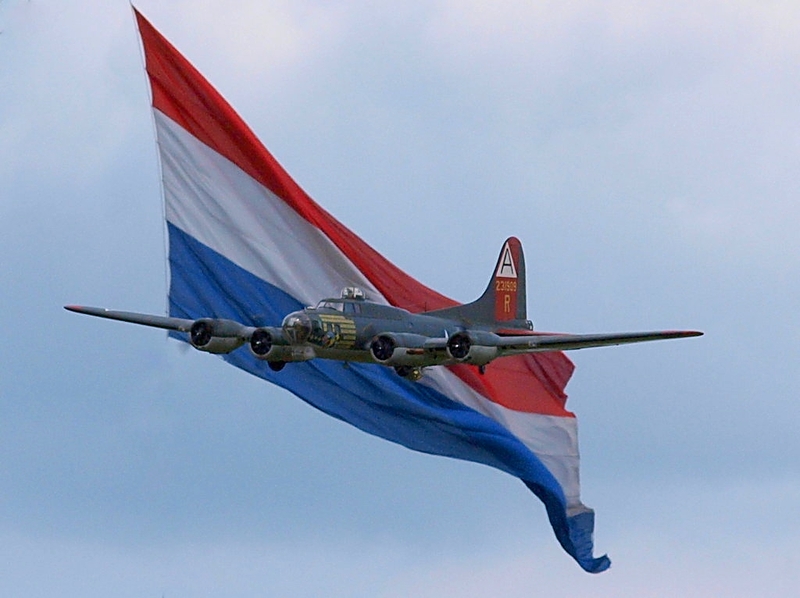 With the Design of the B-17 was started on 18th July 1934, and the prototype B-299 flew at 28 July 1935 with four Pratt and Whitney Hornet engines 850 hp. 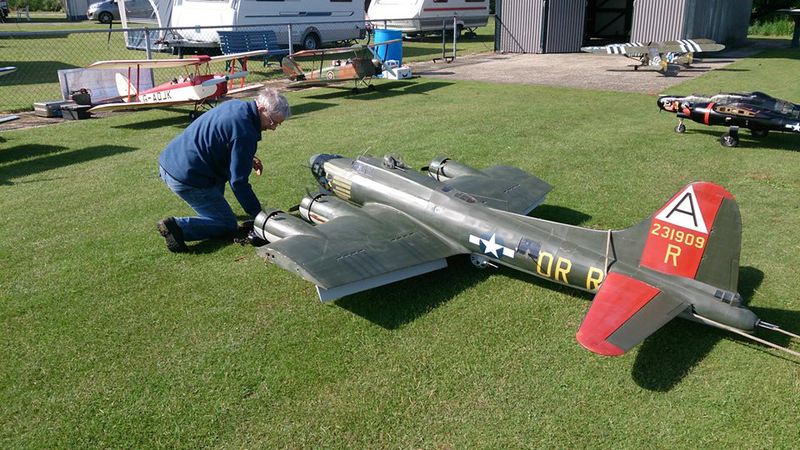 It crashed unfortunately on 30th October 1935. 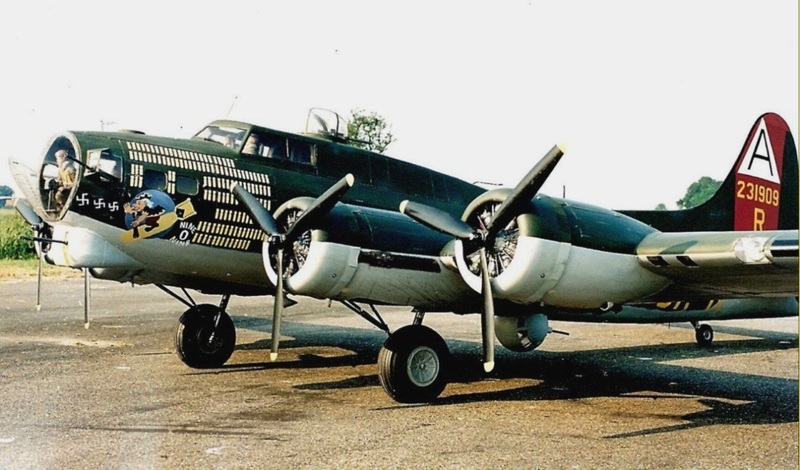 In spite of this, the USAAC ordered 13 Y1B-17 and 1 Y1B-17A with turbo chargers for the Wright Cyclone engines, they went into service as B-17 and B-17A. 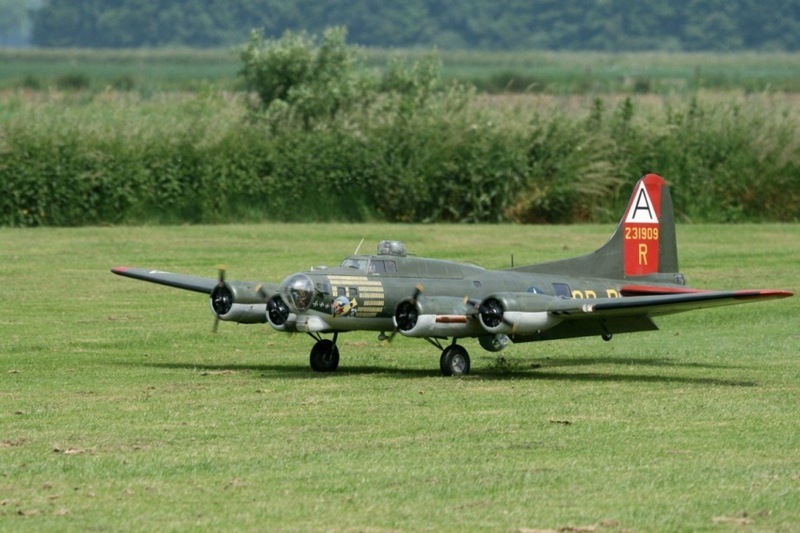 Than came the B-17B (39 ones) with modified fuselage nose ,larger stabilizer and turbo chargers. 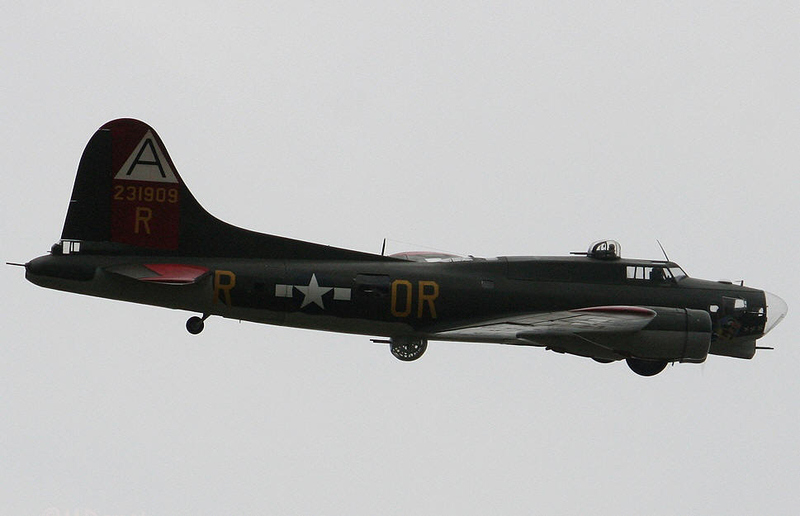 They were followed up by the B-17C (38 ones) with 1200 hp engines, more armour and self-sealing tanks. 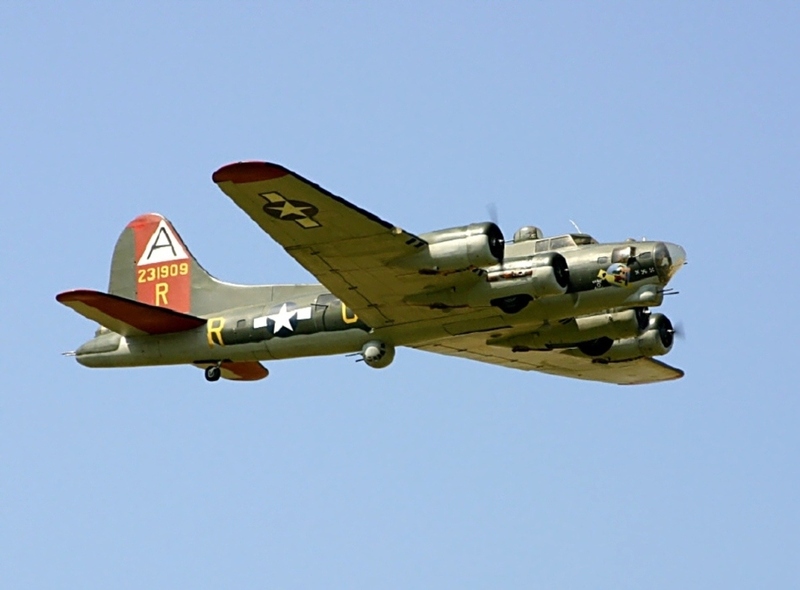 The next type was the B-17D (42 ones) with more improvements, 30 of them were destroyed at Pearl Harbor 7th dec 1941, and the USA got into the war. 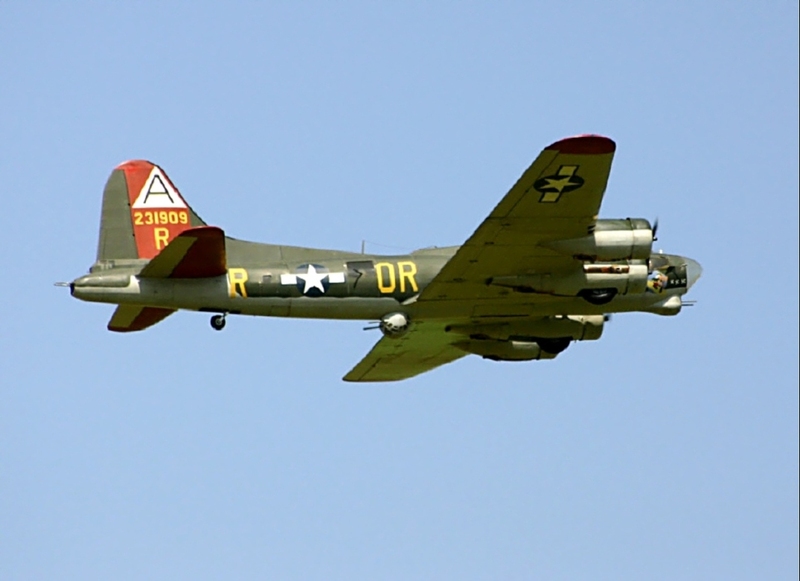 The B-17E (512 ones) was visible different from the earlier types, it had, as all the later B-17’s, the characteristic giant and far forward dorsal fin, a larger stabilizer, improved armaments, i.e. 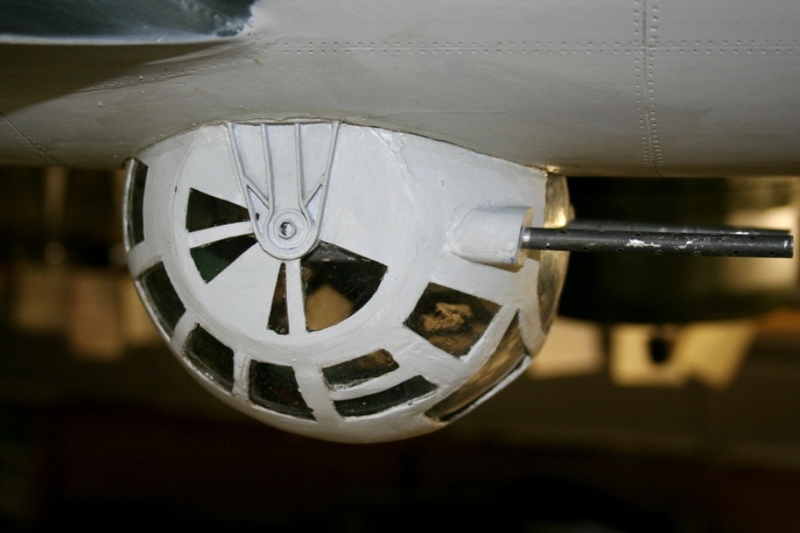 a Bendix upper-turret, a Sperry-ball turret and a tail-gun. 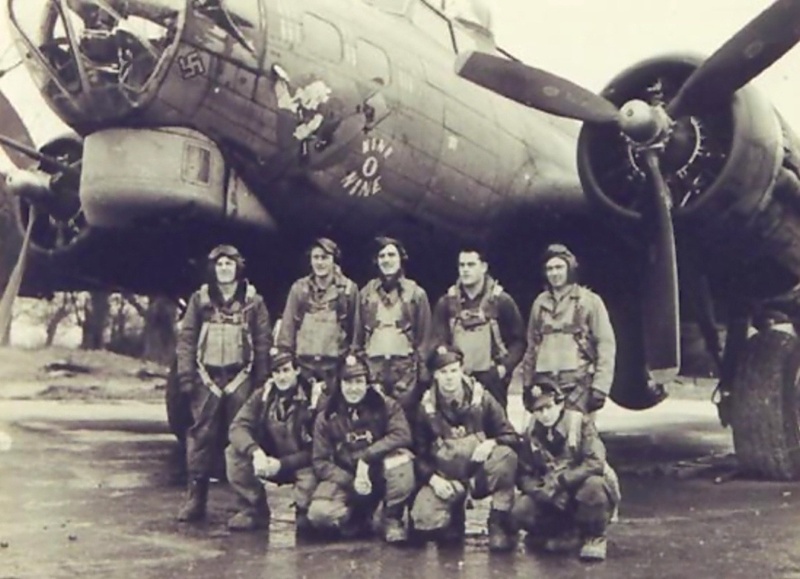 The crew increased from 6 to 10. 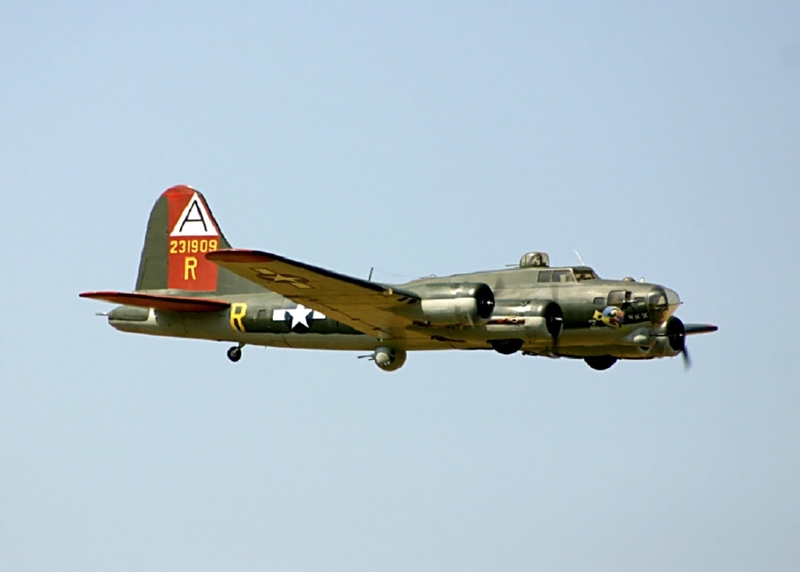 In May 1942 the first B-17F (3000 ones) flew, with more changes, but the only visible difference was the more sharpened and frameless plexiglass nose dome. 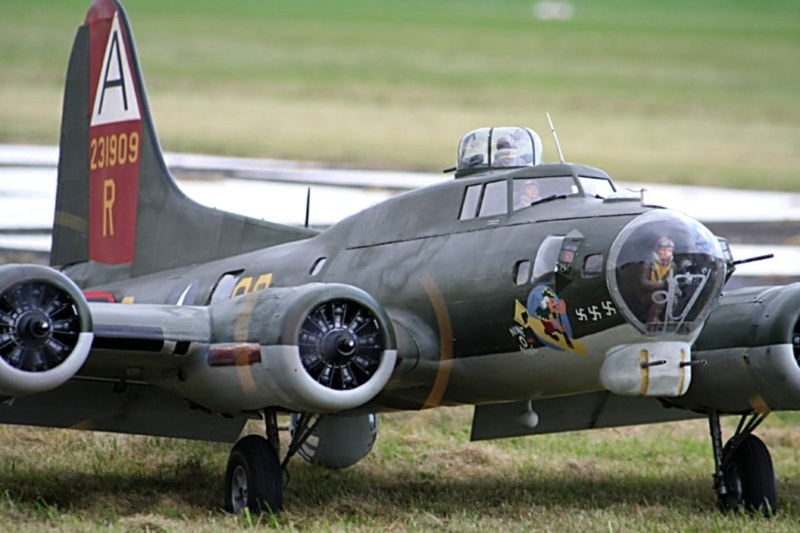 The most built was the B-17G (8680 ones), she was the result of bitter gathered fighting experience, a chin-+ cheek turrets and a Cheyenne tail turret were fitted, better turbochargers and paddle props. 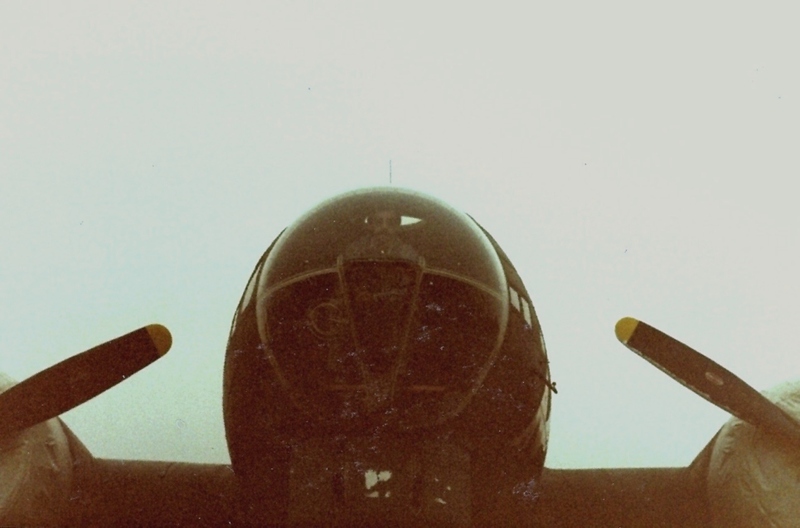 On the B-24 Liberator the Sperryball under-turret could be retracted inside, but not on the B-17. 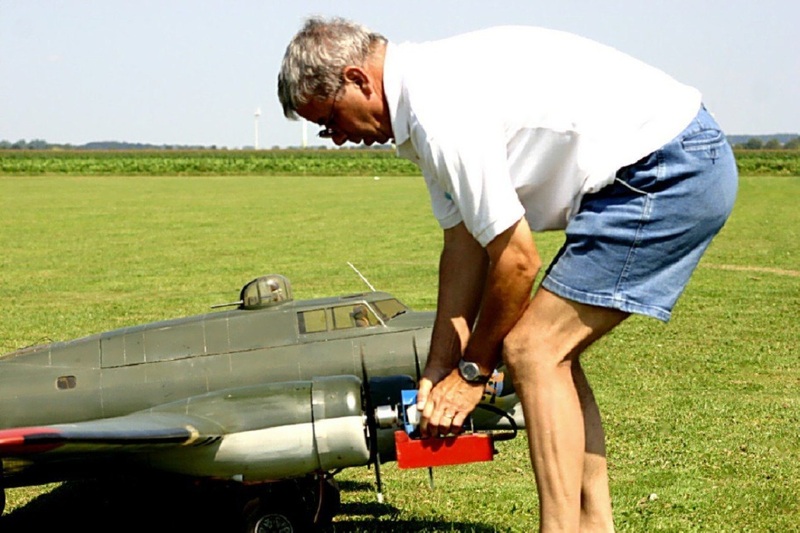 A crash-landing was a disaster for the Sperryball gunner, so he had to leave the turret very quickly when time was left, and unbolt it with special tools and than it felt down. 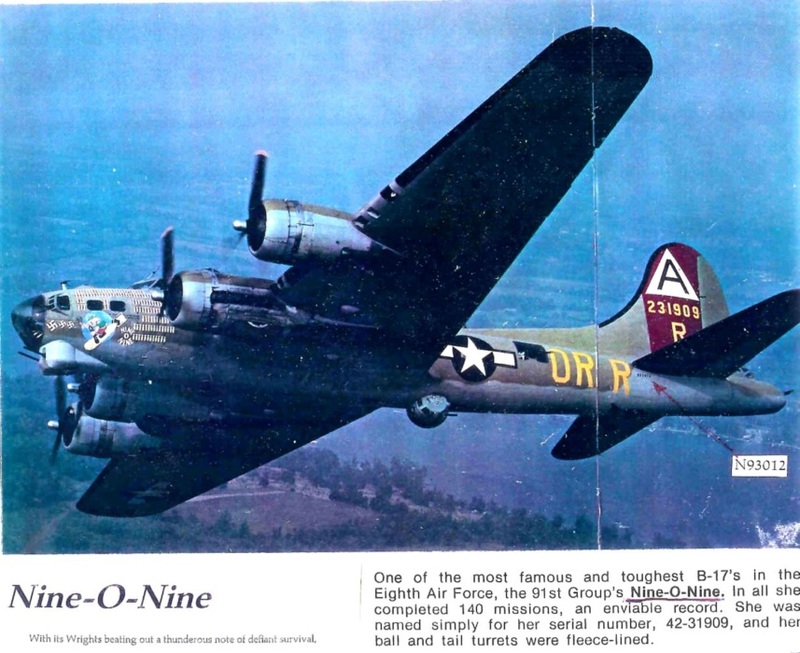 As prototype I chose again the Nine-O-Nine (an early B-17G with the older type tailgun and not the Cheyenne turret) simply because I had still the complete documentation of this plane, when I flew the 1/10th (1:10) model in the mid-eighties for some years. 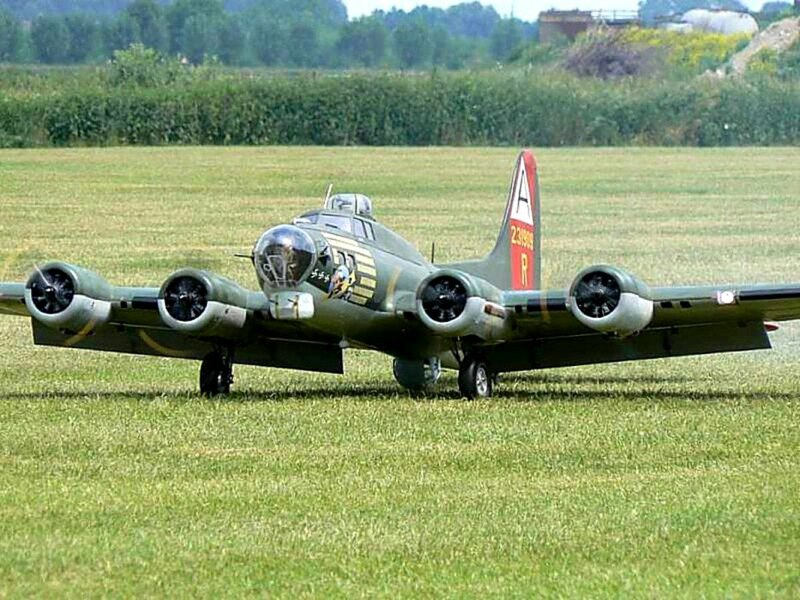 This bomber got her nickname from the last three digits of her serial-number 231909 and was based at Bassingbourn England, belonged to the 8th USA Airforce, 91st Bombgroup, 323rd Squadron. 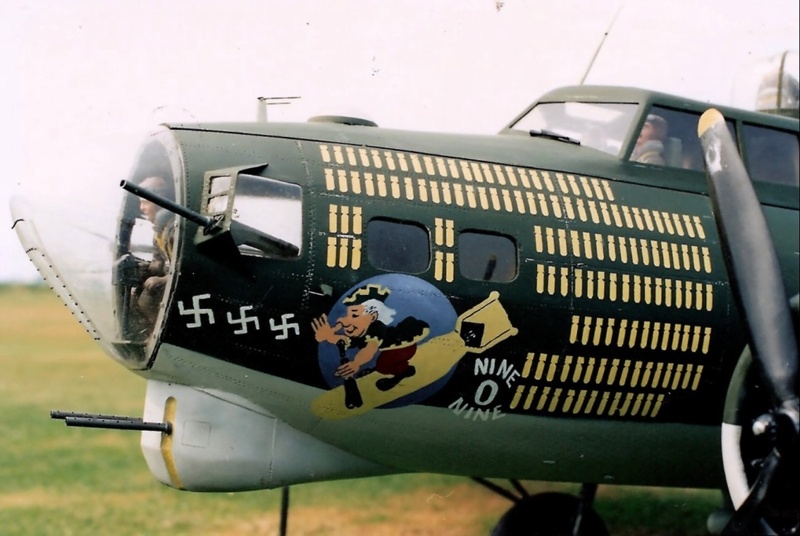 She flew 140 missions all over Germany, survived the war, without ever having to turn back from a mission, never lost a crew-member, also a lucky plane! 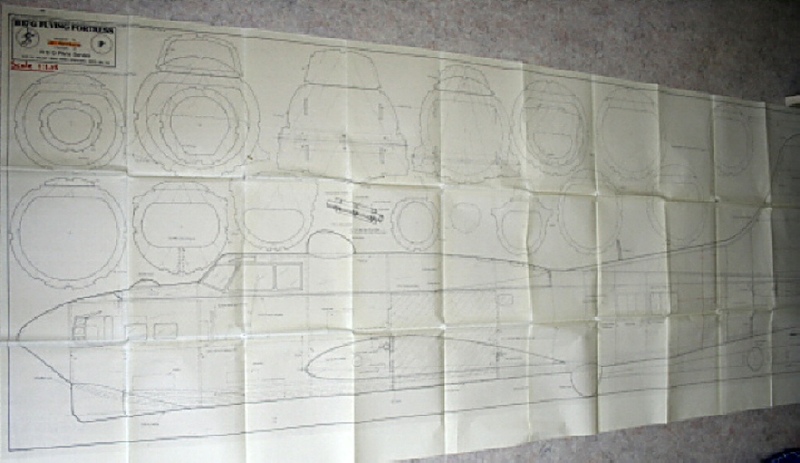 So I enlarged simple my own and very detailed 1/10th (1:10) plan into scale 1/8th (1:8). I had to made some changes, because of the transportation; Fuselage in two parts, removable stabilisers, and each wing-half is from aileron to tip also dismountable. or interference through another transmitter being switched on! (No. 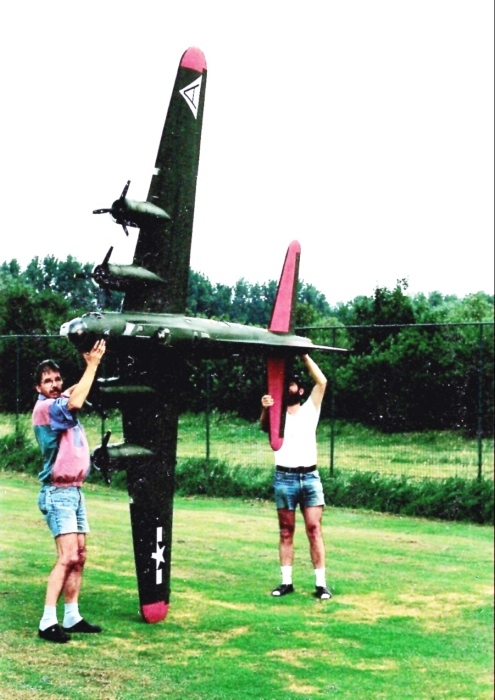 2 model in 1991). 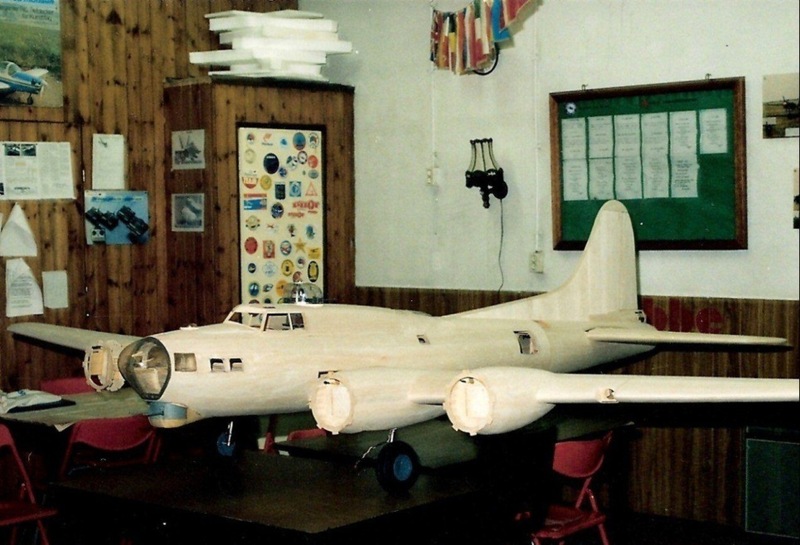 So in autumn 1992 I started the new large B-17 model, completing the fuselage and tail surface airframe basic construction over the winter months. Built, as with all my large models in two sections laterally. 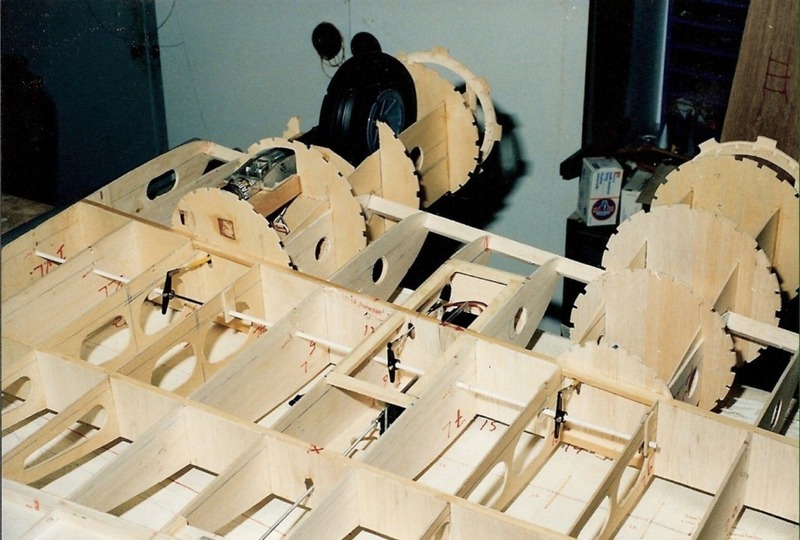 The larger underside sectionformers were jammed inverted on the building board with the flat side down. 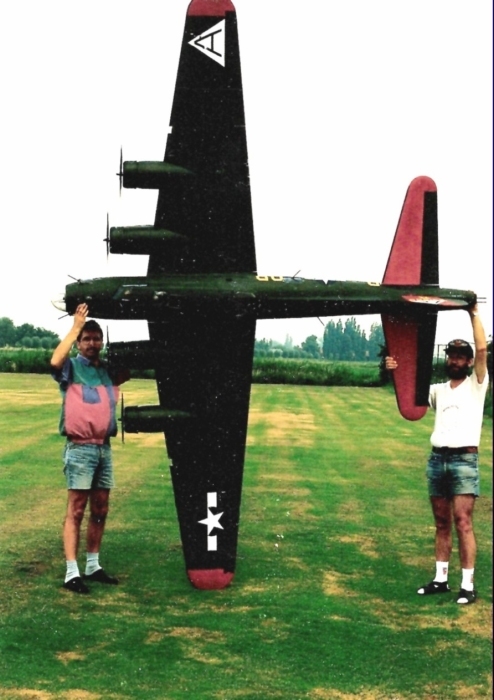 Provisions for the fuselage-joiners were built in, formers connected with stringers and at the bombbay /wing-fixing area also connected with. 2mm plywood strips + an extra pair of rootribs. 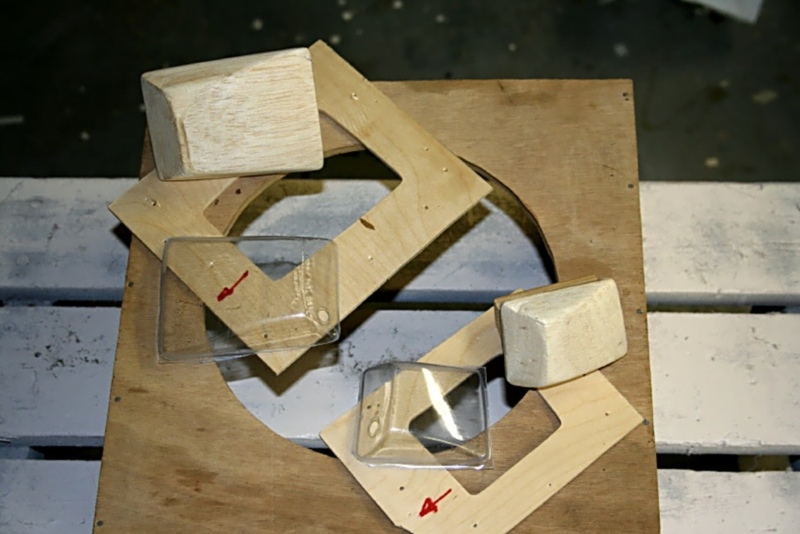 ln this way a centre box was created, to which the nose and tail sections are attached. 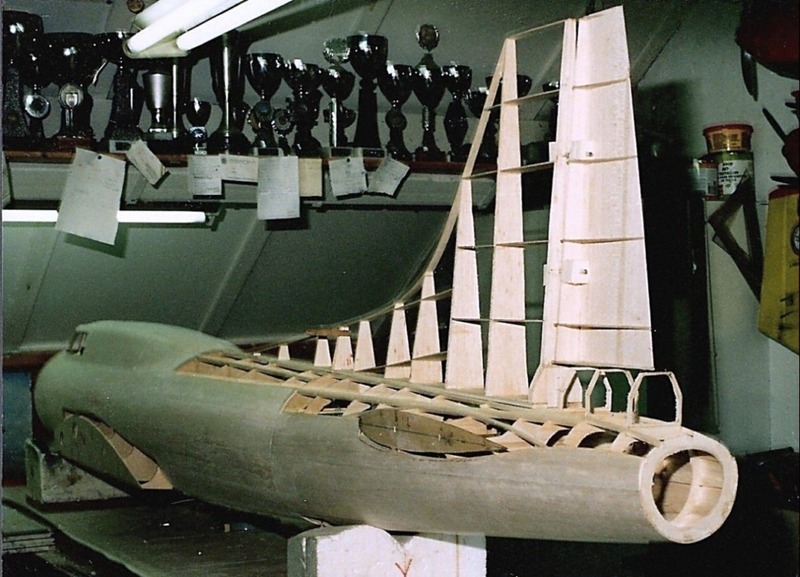 The framework was planked as far as practical, but many provisions and installations had to be made, for disconnecting the internal closed loop control linkages for elevators, rudder and tailwheel. 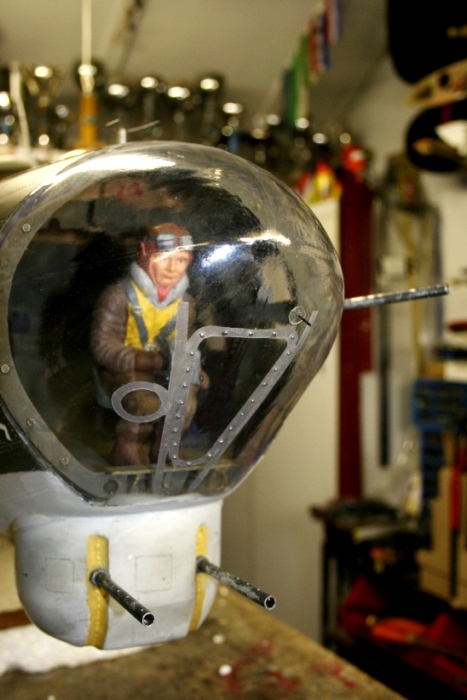 The servos were placed as for as possible in the nose, to avoid the need of ballast. 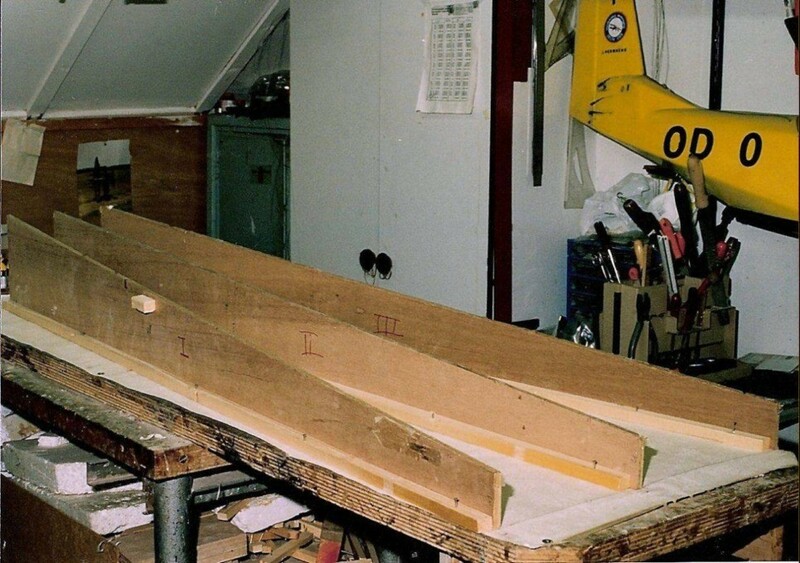 After drying, the fuselage halve was removed from the building board and turned upright and supported on foam blocks. Now the tops of the formers were added, including them for the giant fin, and the upper surfaces planked. 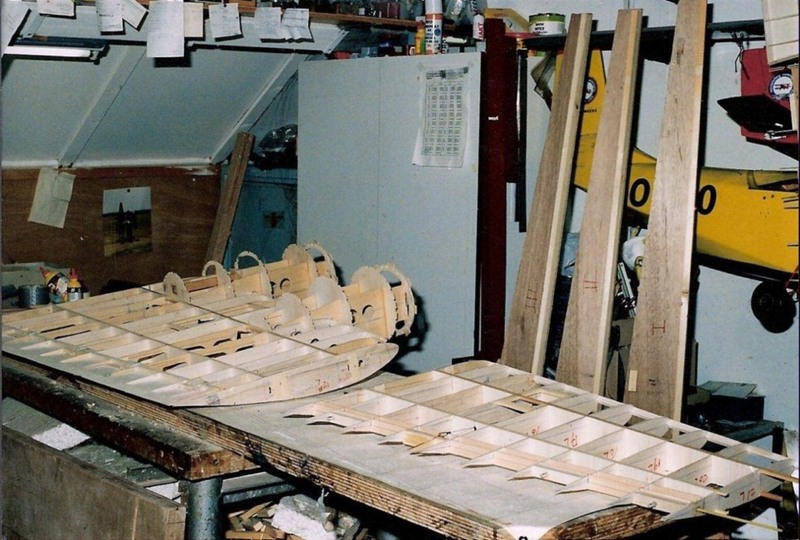 Wing and tailplane fillets were built on, and the flowing lines were being achieved with some of the formers. 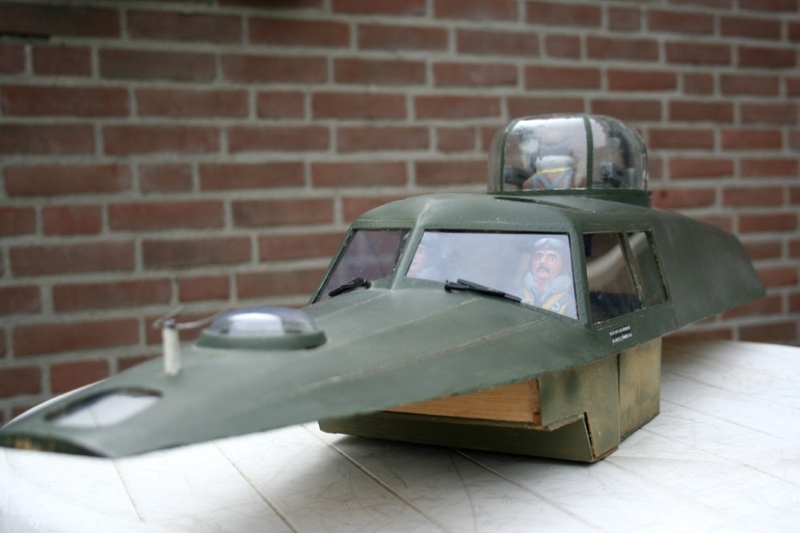 The whole cockpit hood is removable (as with all my large models), radioinstallations, powerpacks, bombbay- area and so on, are always very accessible. 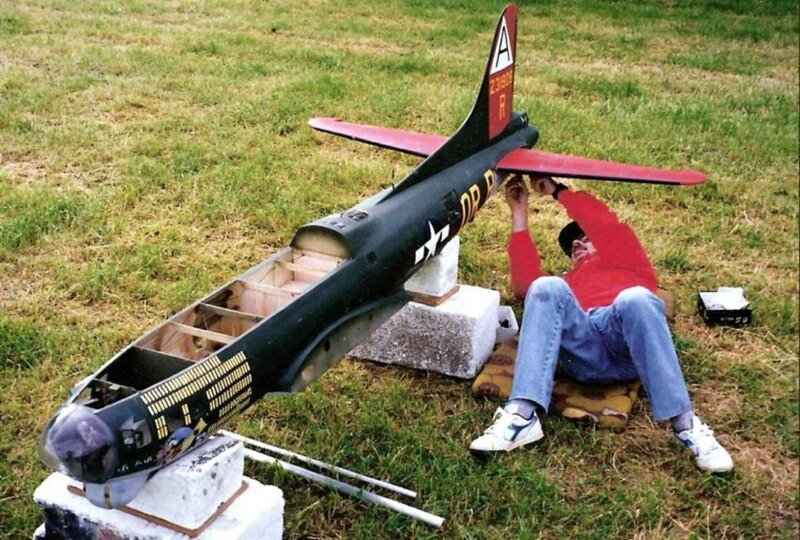 Now the rear fuselage could be separated from the front half, by loosening the 4x M4 socket bolts and saw through, between the 2 dual formers and through the flat brass tubes. In this way it will fit accurately! 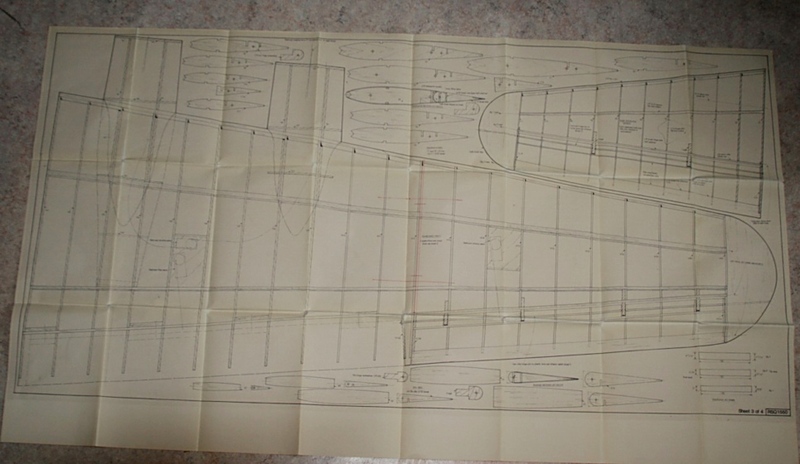 has a symmetric section, NACA 0012, and is also a rib construction. 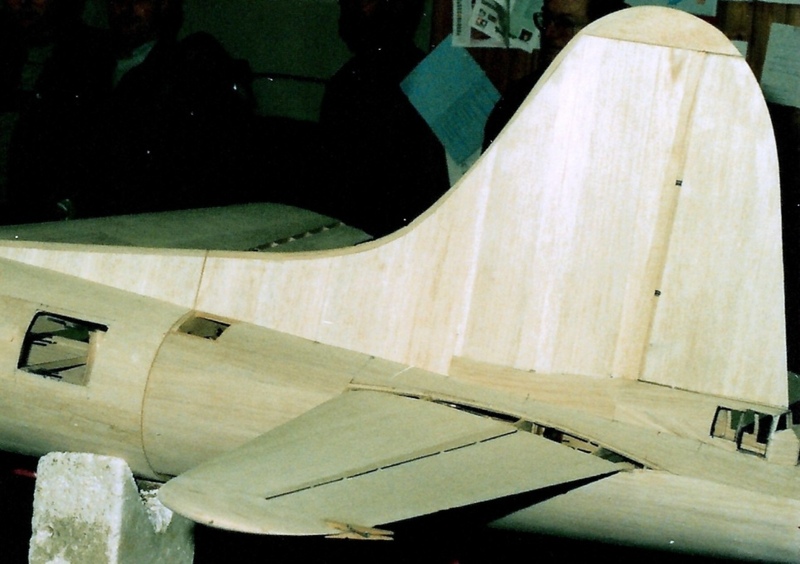 It has been built, as later also the wings, on raised supports (12mm plywood strips). 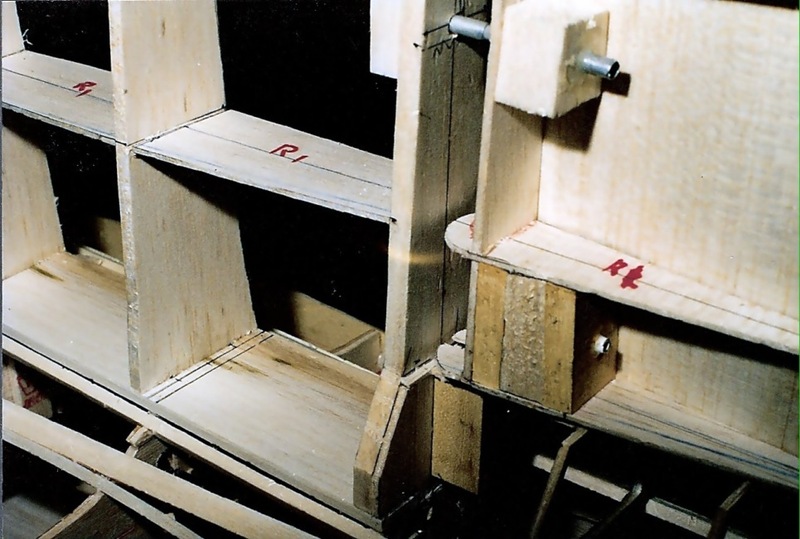 Elevators were built on, in one piece with the stabiliser, with pin hinges and a long 1,5mm piano wire in a plastic tube, but not planked in one piece with the stabiliser. So they could be cut off without any trouble. 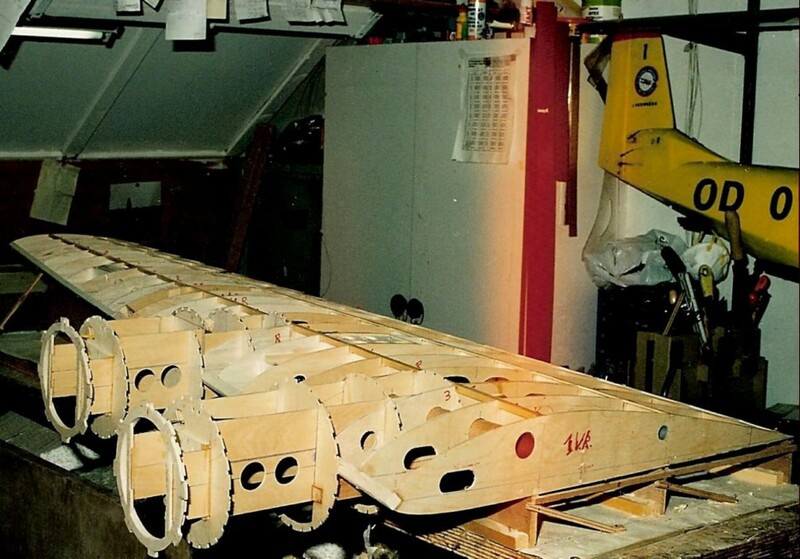 Before planking, joiners for /to the fuselage (dural and carbon tubes) were glued in. 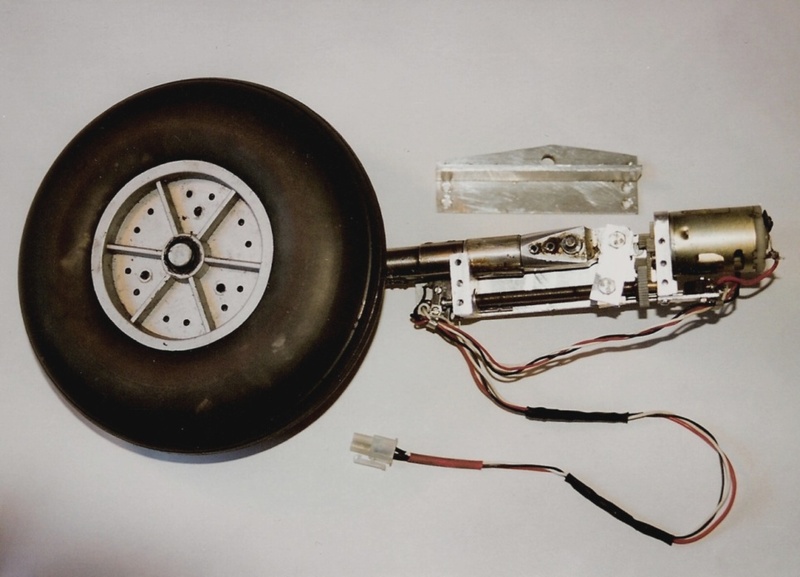 The elevator control linkage is provided by sliding one piece of brass tubing (ٱ 5mm glued in elevator) into another (ٱ 6mm in the tail-section). The tubes are supported on Pertinax (Paxolin) bearers inside the fuselage, the elevator control horns being separate for individual control. 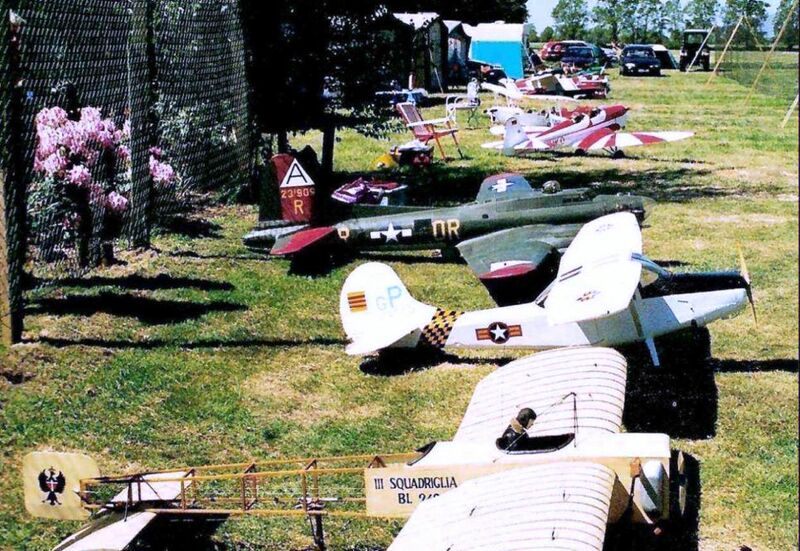 Now it was april 1993, and everything was put away, because a new flying season for the Sunderland was coming! With these I started in Autumn 1993. 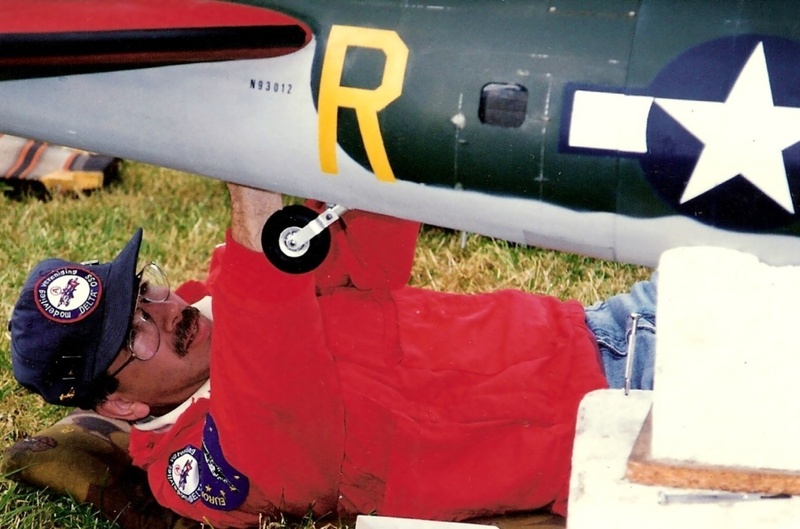 They are also a rib-construction and have a NACA 4415 profile from the rootrib to the aileron, and further on progressing to a NACA 2415 profile section at the tip, so an aerodynamic wash-out has been built in (a geometric wash-out always gives drag!). Wings I always build on raised supports too (strips of 12mm cheap plywood), it allows building on the nacelle construction etc. 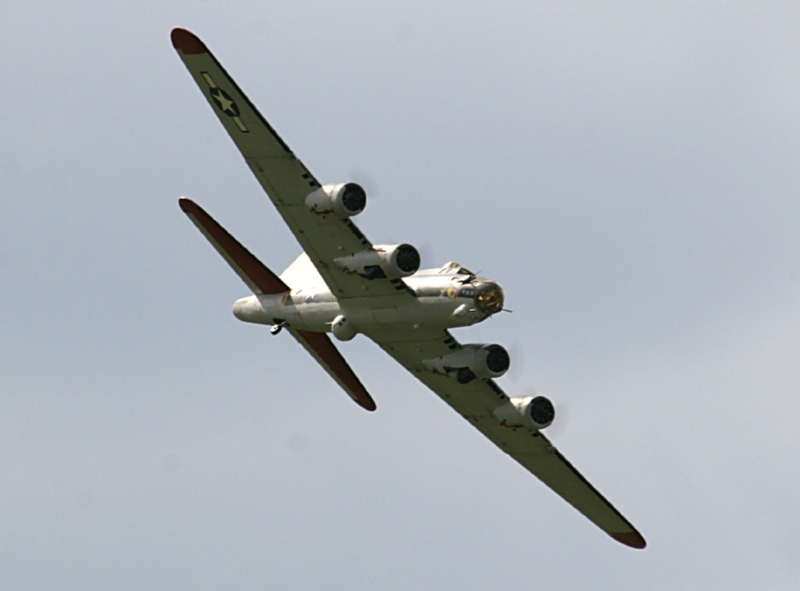 Because of the large wing chord, there are three; under the main spar, rear spar and rib ends. 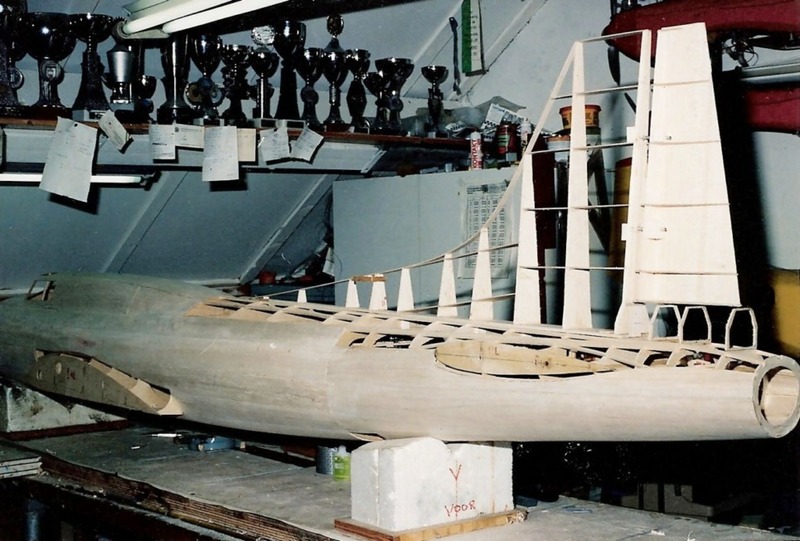 In these supports the wash-out and dihedral already are built in, and on these (with Sellotape on them) the lower spars were pinned, and then ribs could be glued on, the upper spars, and leading edge. 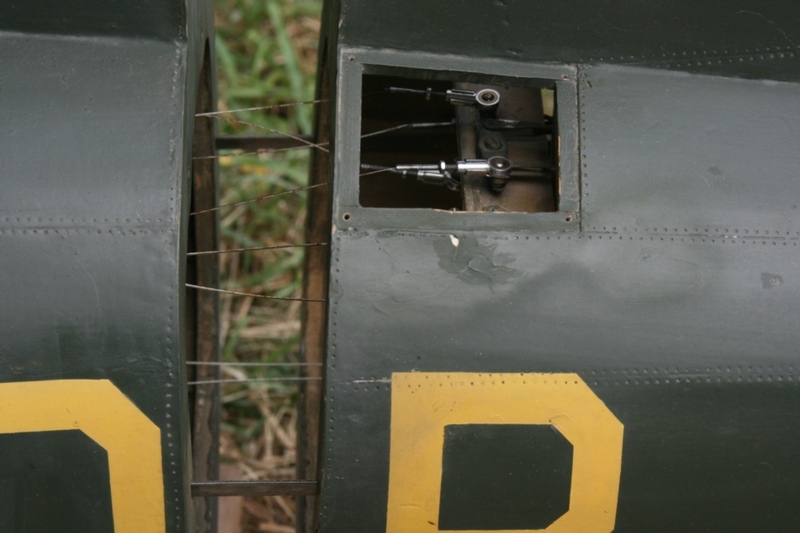 The ailerons are build in with the wings, the same as with the elevators (pinhinges and a long 1,5mm piano wire in plastic tubes). For the nacelles I used again my own construction; the nacelle side walls are in one piece with some ribs, over these ribs the nacelle formers and firewall were glued. 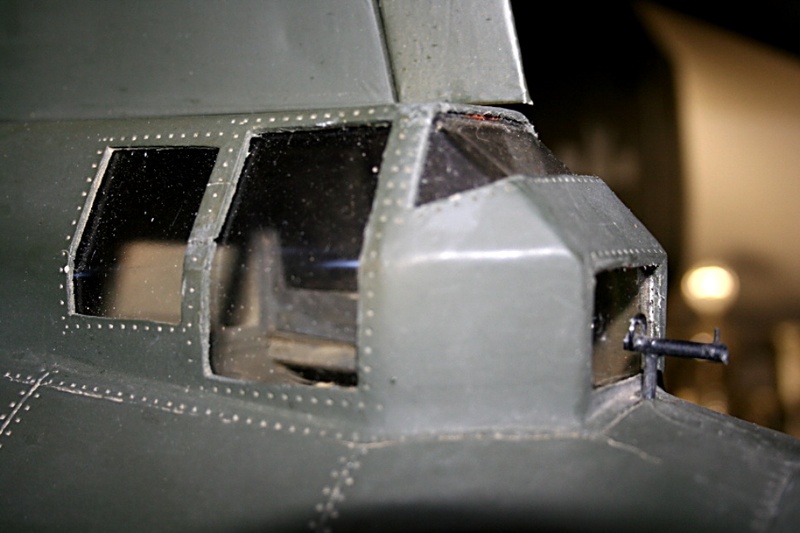 Parts of the upper nacelle must be removable for access to the fuel tank. Now some provisions were made for the servo fittings, extension leads, throttle linkages, wingjoiners, flaphinges and so on. 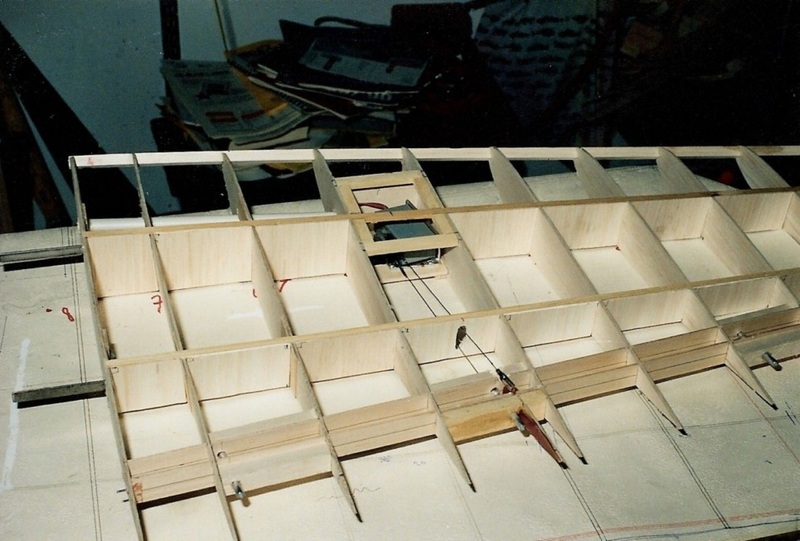 The wing panel sheeting is commenced with the wing-underside and the wing was replaced on the supports and weighted down, this also ensured the retention of a true straight wing. 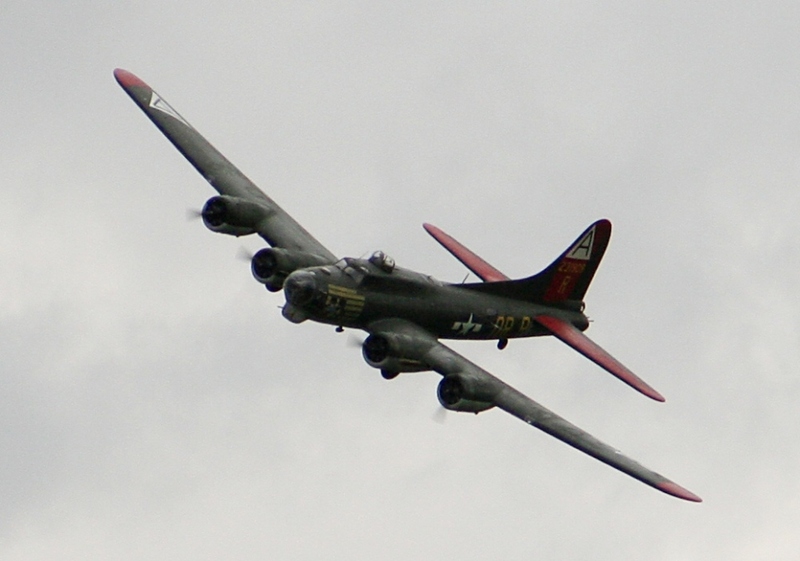 The same for the wing-upperside, then the nacelles could be planked. 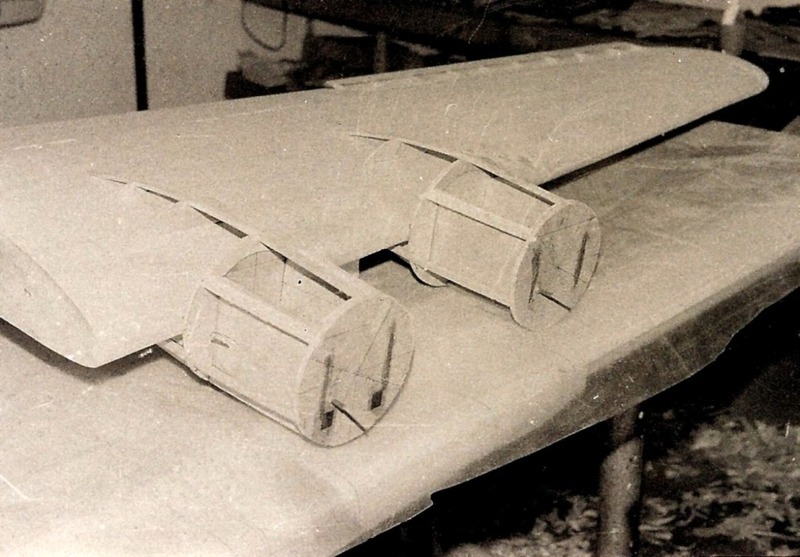 The separate planked ailerons were cut out and convex leading edges glued on to them. 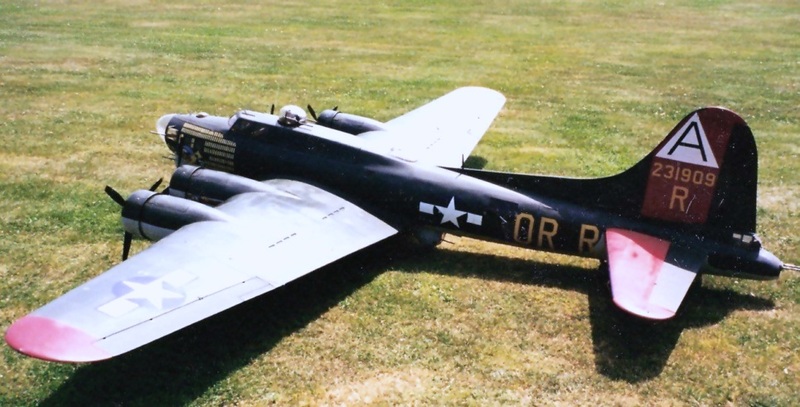 The original split flaps were directly built against the wing -underside, with clear folio between it as a barrier, and the special flap hinges were installed. 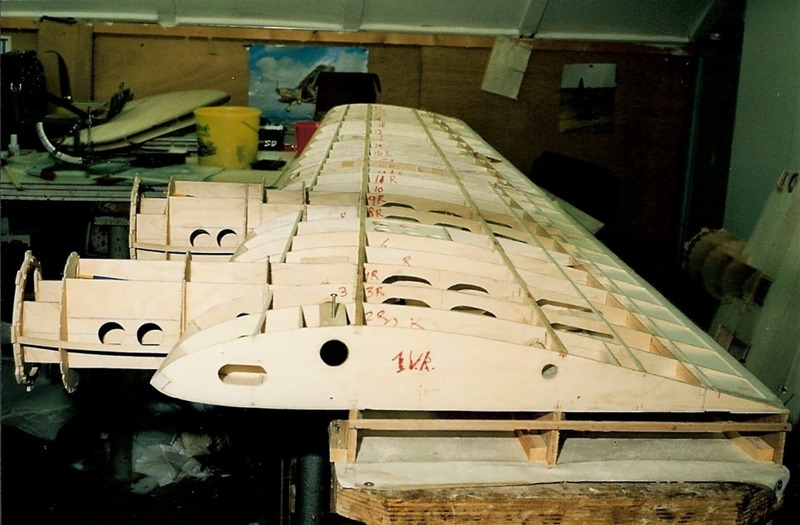 Each wing-half is also divisible in two parts and connected with joiners (dural tube 18mm and carbon tube 11mm in polyester GRP tubes) and fixed with long sheet- metalscrews through wood blocks and tubes (piece of hardwood in it). 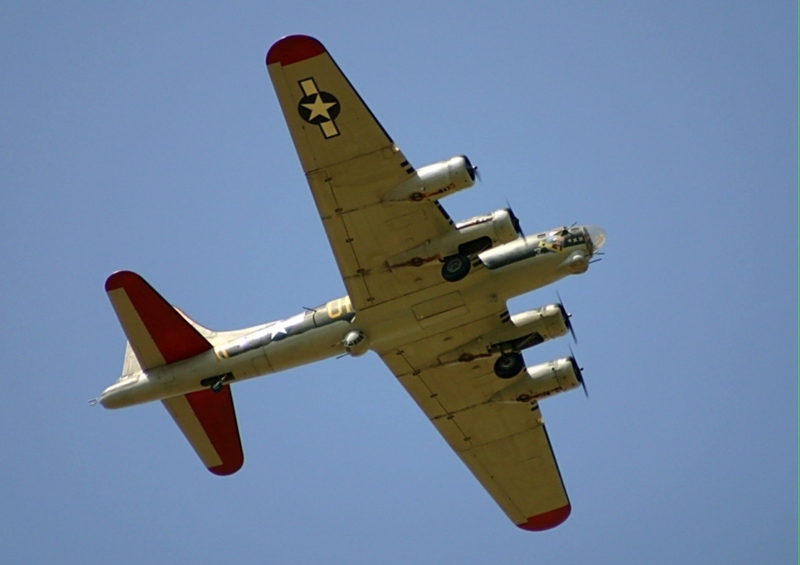 The wings themselves are fixed to the fuselage with a dural tube 30mm at the front and a 18mm one, at the rear. These tubes are in one long piece and are every time inserted through polyester GRP guide tubes in the fuselage and than on both sides, the wings can be pushed on, and also fixed with long sheet-metalscrews through wood blocks and tubes. (In the same way as the stabilisers). The cowlings (diam. 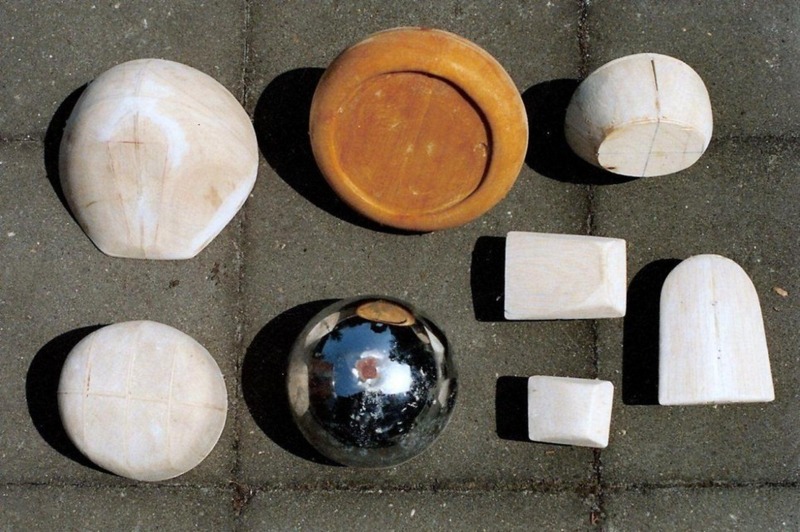 180mm) are made from aluminium stove pipe with a 3mm plywood former half glued in. 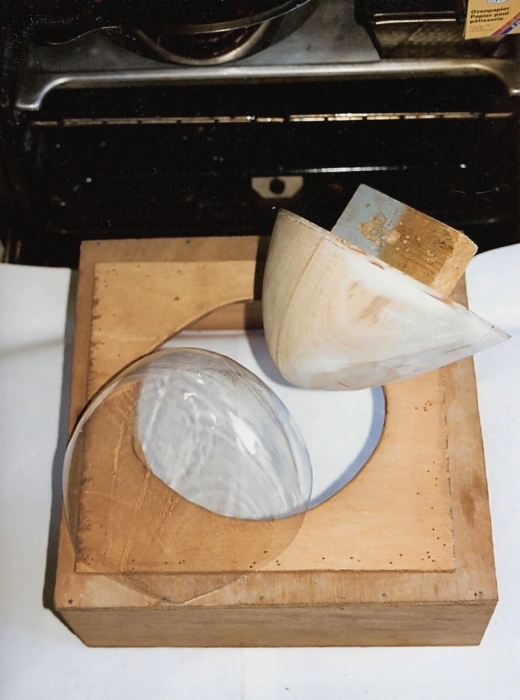 To these formers the radial motor-dummies were glued, and then over these rings a polyester GRP moulded nose cowl ring. In the aluminium pipe, cooling gills were slotted and bent out a little bit. 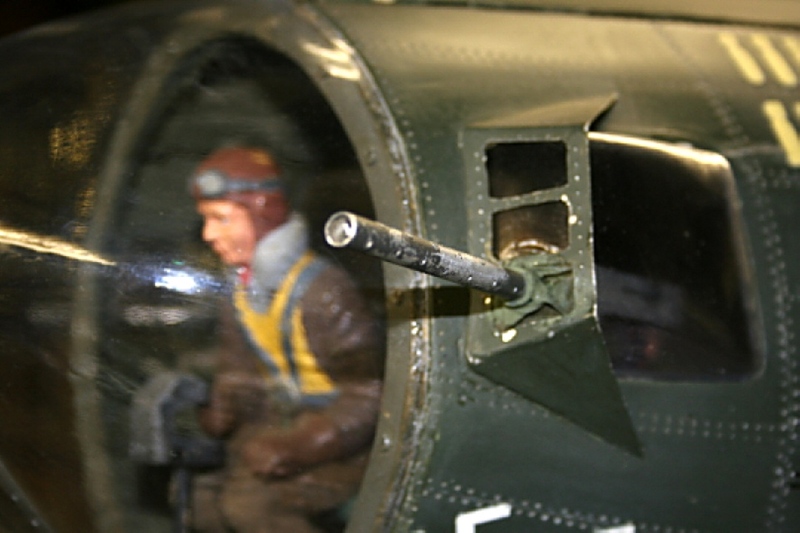 Upper turret, nose cone and cheek gun shields were formed, with plugs, from 1mm clear pvc in the kitchen stove. 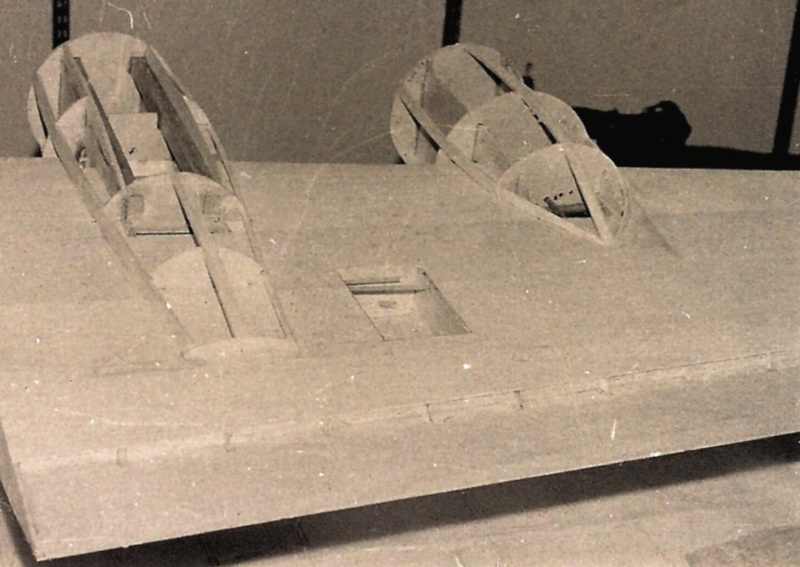 Chin, Sperryball and tail turret were made from polyester GRP, on mouldings, with the help of big balloons (blown up) pushed over the mouldings. The retracts are electric via a screw-jack and microswitches, it is made from stainless steel and aluminium (own construction). 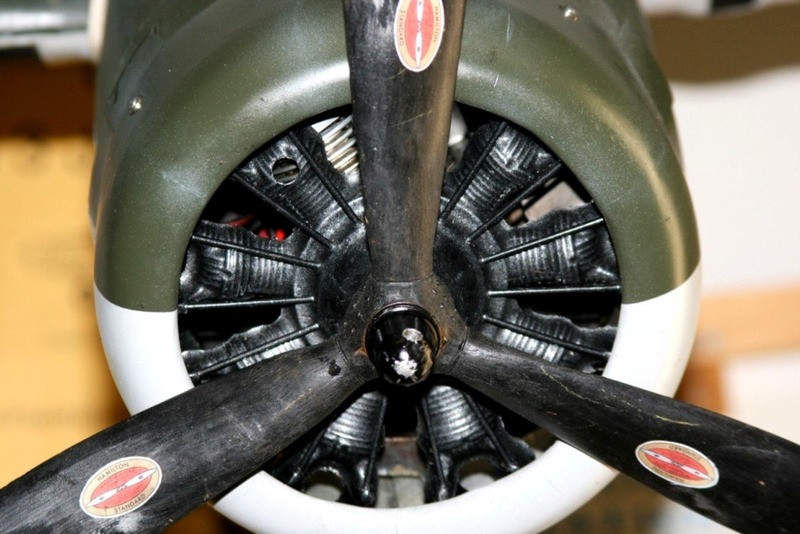 They are mounted in the inner nacelle, under the tank, on hardwood bearers. After a final sanding and a filler, everything was covered with light weight tissue and one coat of clear dope. Then scale panels and so on were scratched- in, two more coats of clear dope and sanded, a wash-primer was sprayed on, wet sanded and rivets were applied. Finally the model was sprayed with the authentic colours (matt two-component acrylic) and weathered. Markings and codes were sprayed on. 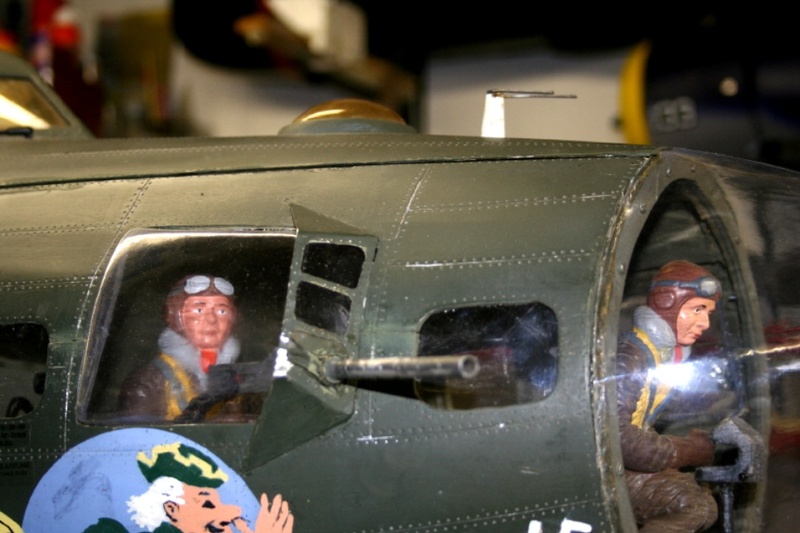 The final details were applied, pilots and some crewmembers were installed, also turrets, windows, cockpit interior and so on. 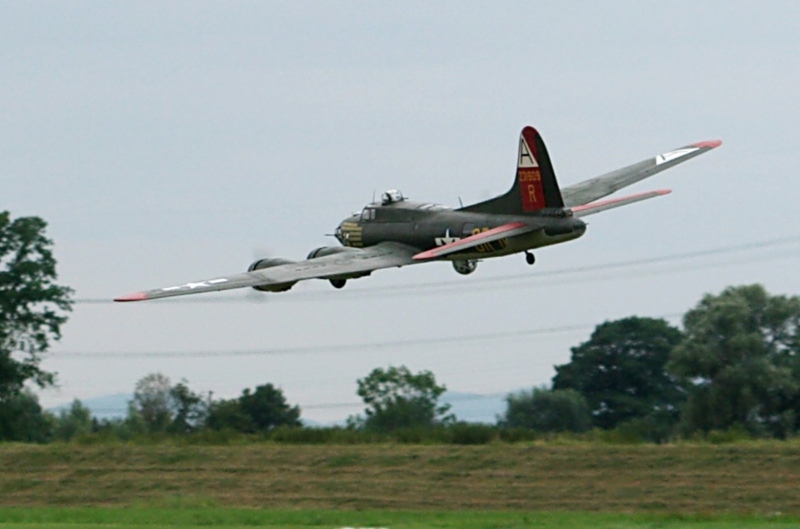 The B-17 was fitted with 4x Four-stroke engines, the English Laser 0.70 (11½cc). 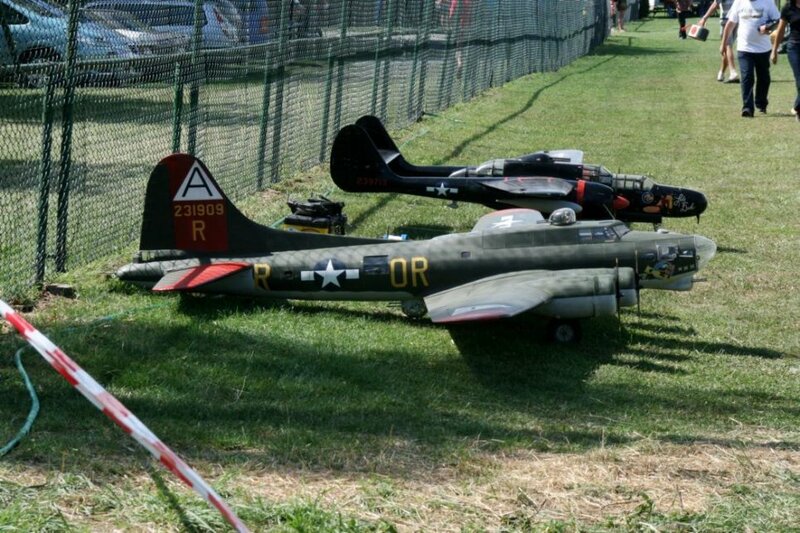 These have only a height of 84mm! (Osmax70 and Saito65 are 96mm) and fit just into the cowl of 180mm. Extension tubes for the silencers were made and hard soldered, so that they came out in the scale exhausts. 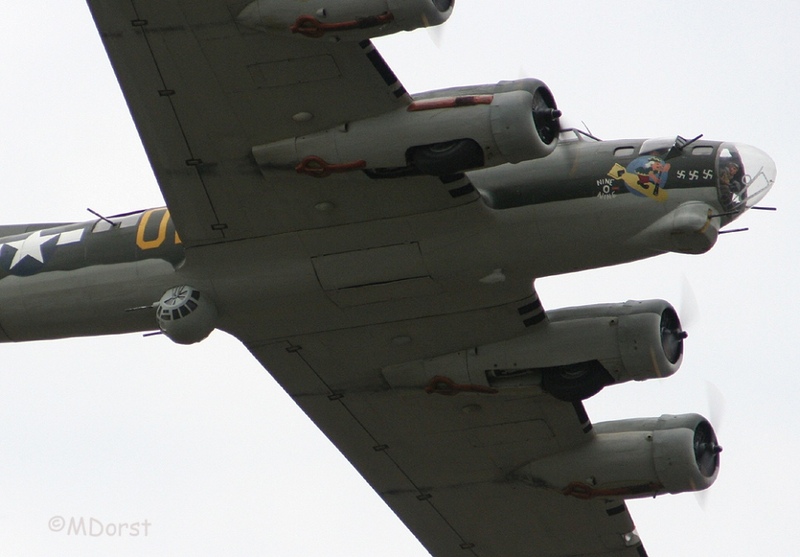 The engines don’t have side or down thrust and no on-board glow system. The Laser engines are very reliable, running smooth and have a deep sound, just real. With APC 12x7 the climbing was very good, but fully throttled the thrust was still too large, sometimes giving problems with landing. 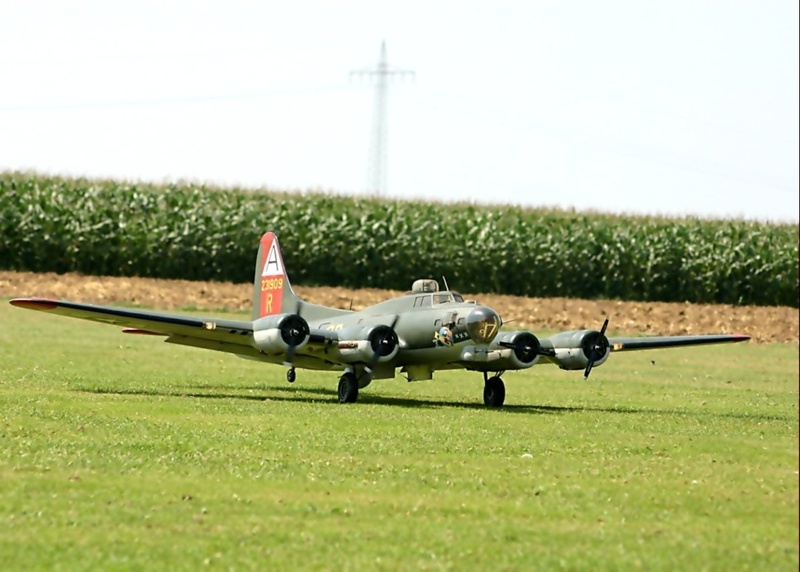 So I changed them for Master Airscrews 13x6 , but that was no good, for the moment, twice a motor cut-off, inner or outer, even the B-17 flew further without any problems, just like the original plane. 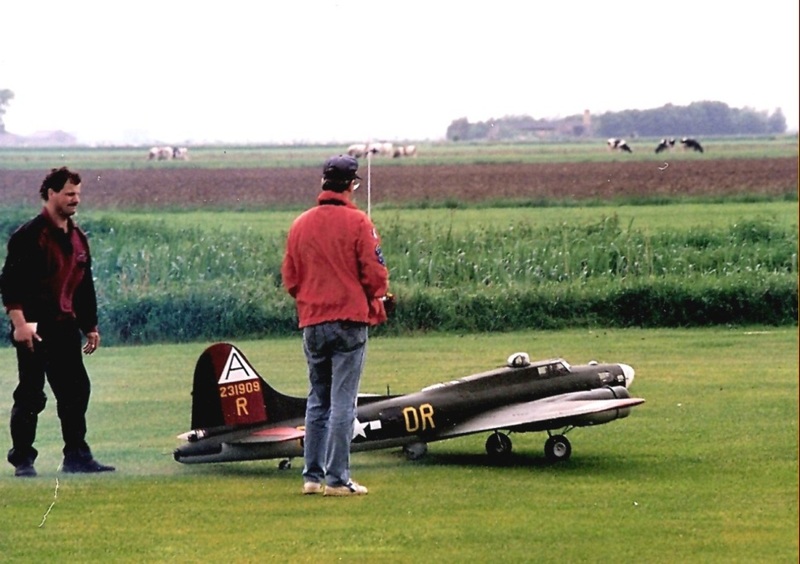 So I changed the props again and now with Graupner 12½x6, now the engines were running and beating superb, and the landings could be slower now! After a year with many flights I tried the Master Airscrews 13x6 again, because the engines were running more routes, and now they were perfect! 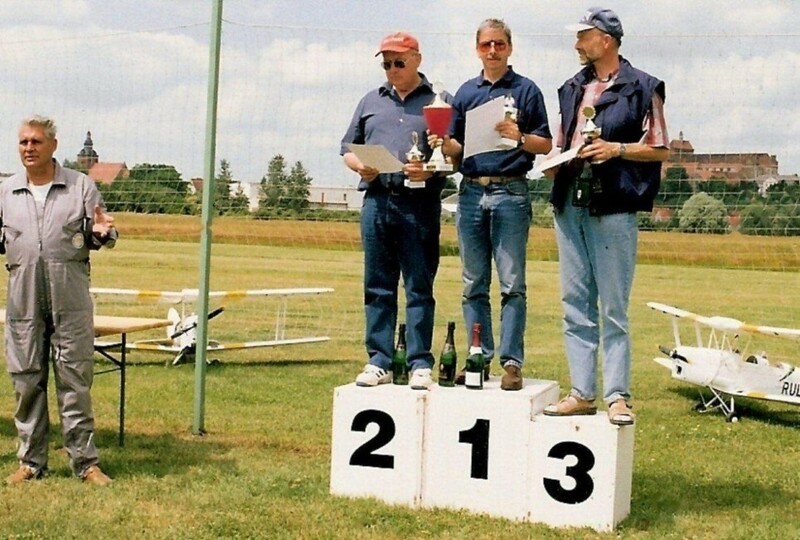 2 PCM receivers, 4 switches, 6x 1700 mah batteries; two for the receivers, two for the aileron and flap extern boosters, this in view of the long extension leads (in 2004 replaced by 2x2=4 batteries, for 2xPower Management System PMS-plus of Engel Modellbau Germany. 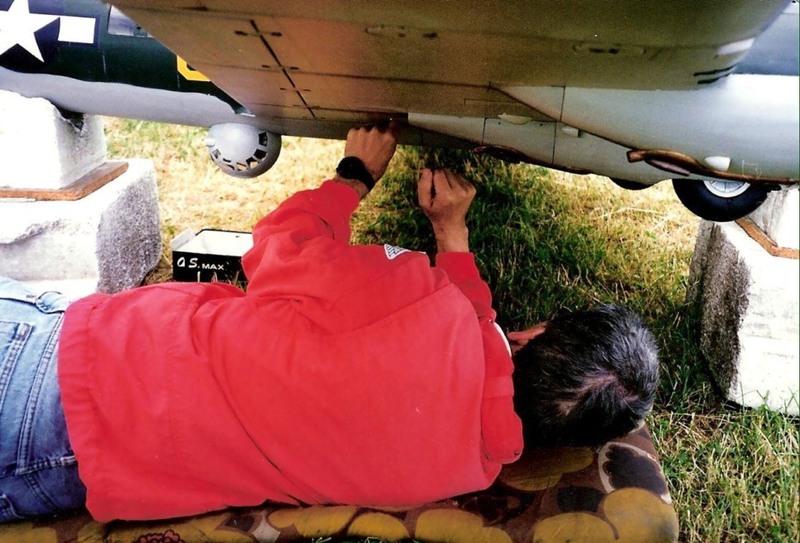 In 2012 the Receivers were changed for 2,4Ghz Graupner GR-24 Hott), 5th battery for landing lights / upper Turret rotation, and the 6th for the retracts. 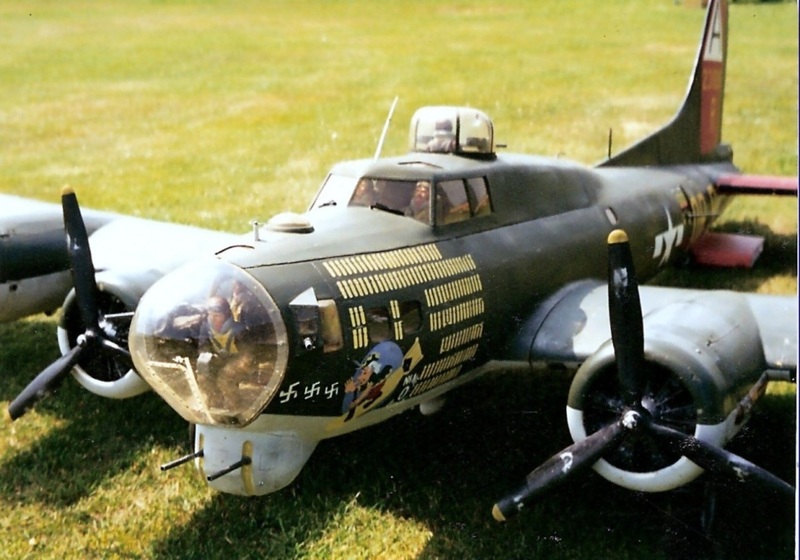 Fuselage servos: 2x Elevator, 1x Rudder, 1x Tailwheel, 1x Micro switch Retracts, 1x Microswitch -Landinglights/upper turret, 1x Bomb- bay doors, 1x Bombs and/or parachutes release. 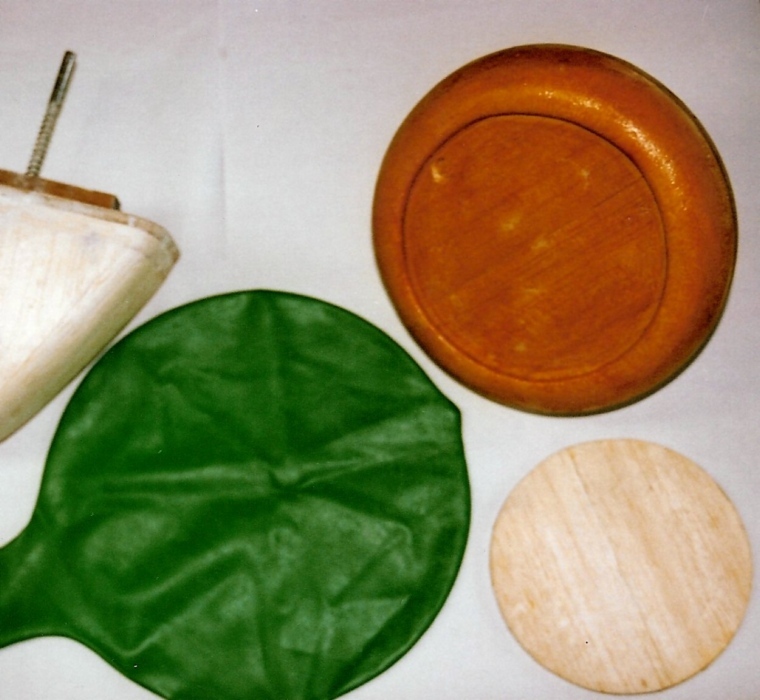 (Total 8). 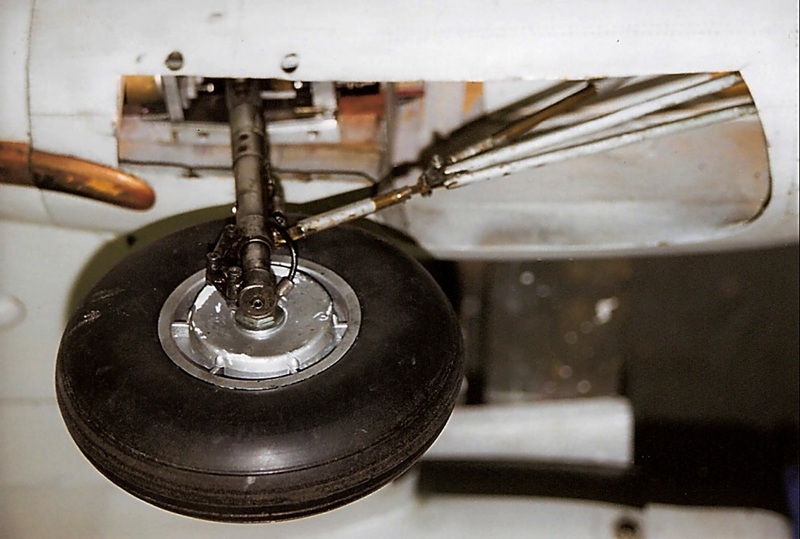 Both elevators, rudder and tailwheel are operated in closed loop linkage system, using stranded and plastic covered wire. 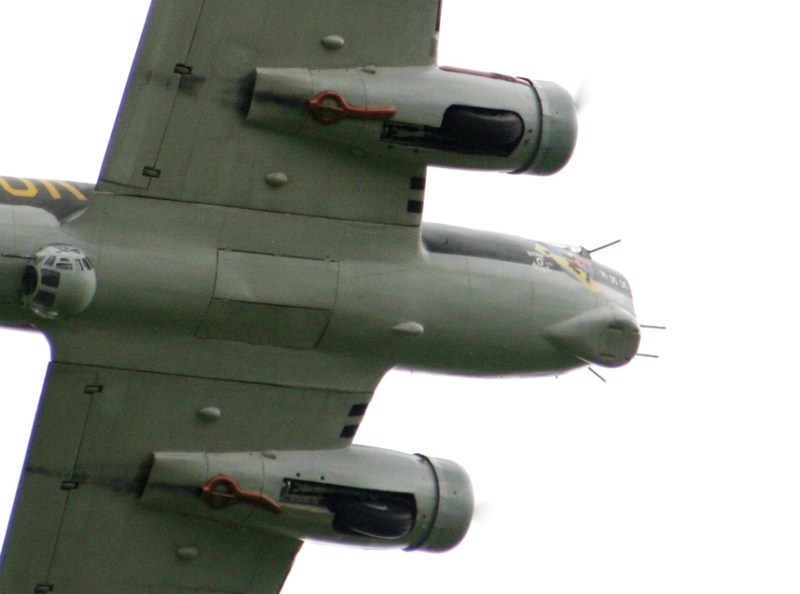 At the rear, where the two fuselage halves join, connection is with ball-links from cranks. Wing servos: 2x Aileron, 2x Flaps, 2x Engines (left and right). 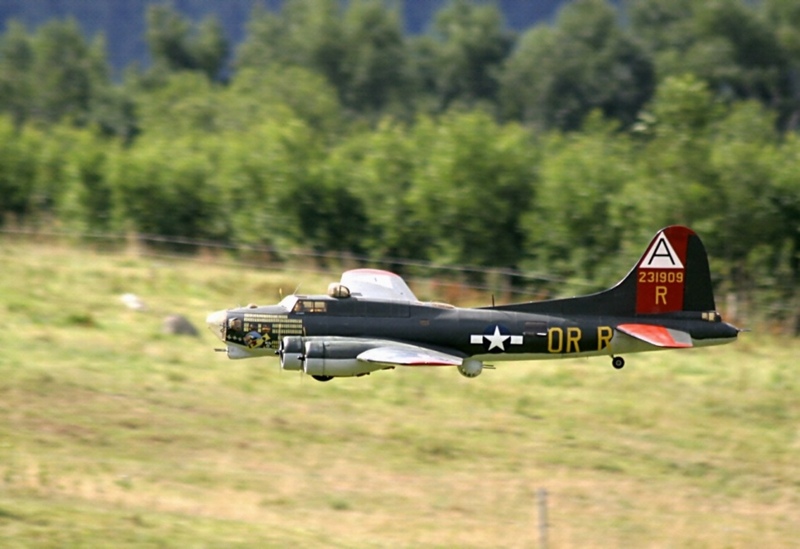 The ailerons also have the closed loop linkage system, the flaps are actuated via inner M2,5 Rod-system, and the pair of engines via rods and horns on a rotating 3mm piano wire in plastic tubes. 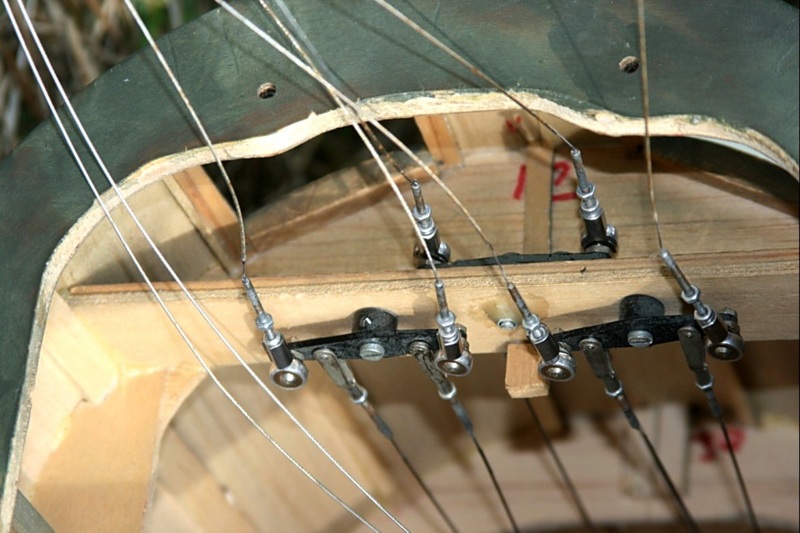 All the leads from each wing-half are soldered to a computer connector, and each positive and negative are connected with a tiny ceramic condenser (1Nf) to avoid aerial effect on the long extension leads! 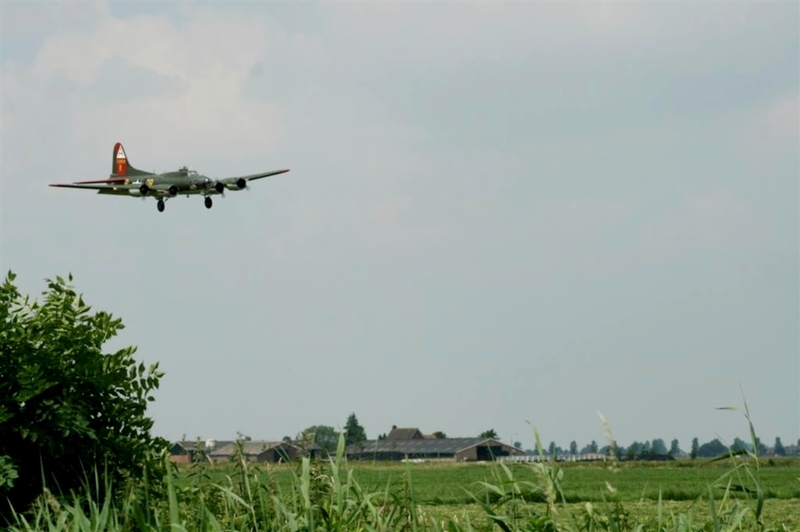 Mixers: 7 mixers are used, for example: Combi-mixer, Left and right engines, two asymmetric mixers for Rudder/ Left and right engines (Taxying). 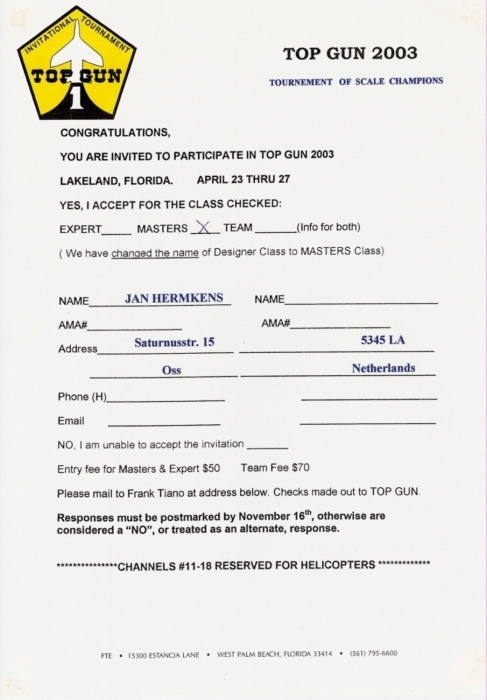 Operating with a pilot and co-pilot is probably a nice piece of teamwork, but the challenge everything operating by myself was greater, besides, in contests a co-pilot is not allowed. 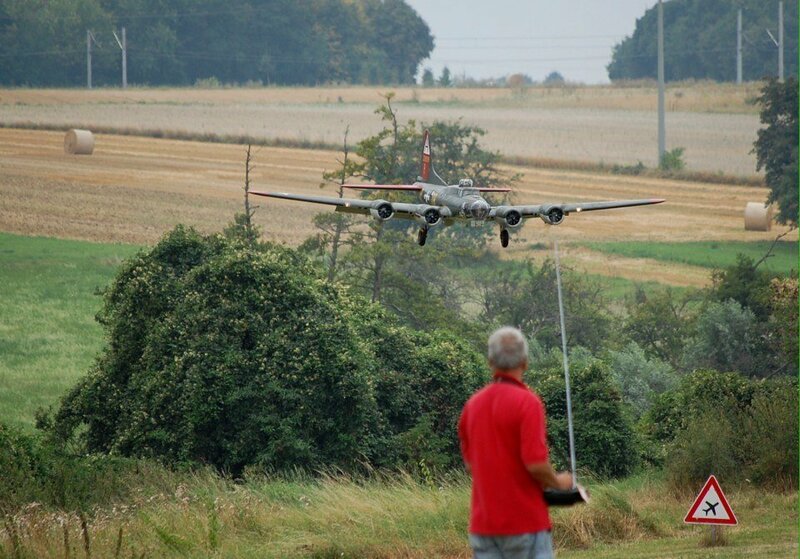 One pilot operating can be done, but you must have a lot of experience and you must know your transmitter very well! 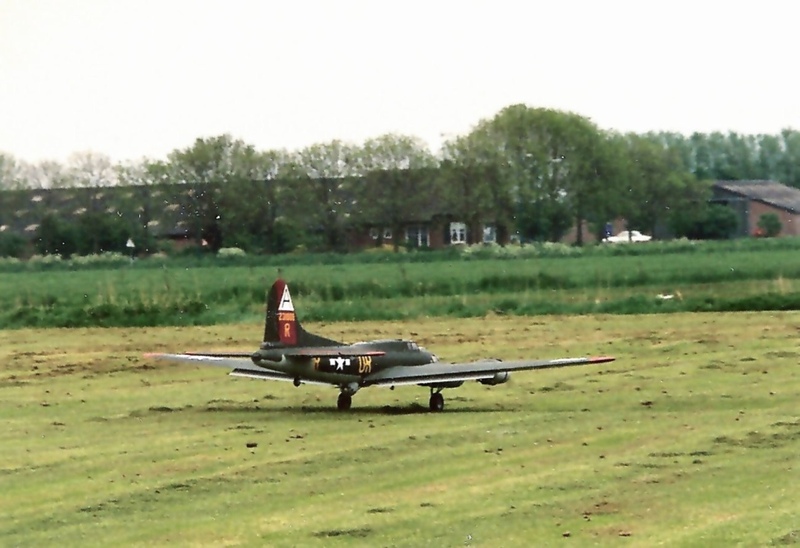 Saturday 7th May ‘94, it was nice weather and I wanted to test fly the new B-17 at a Military Air Base. 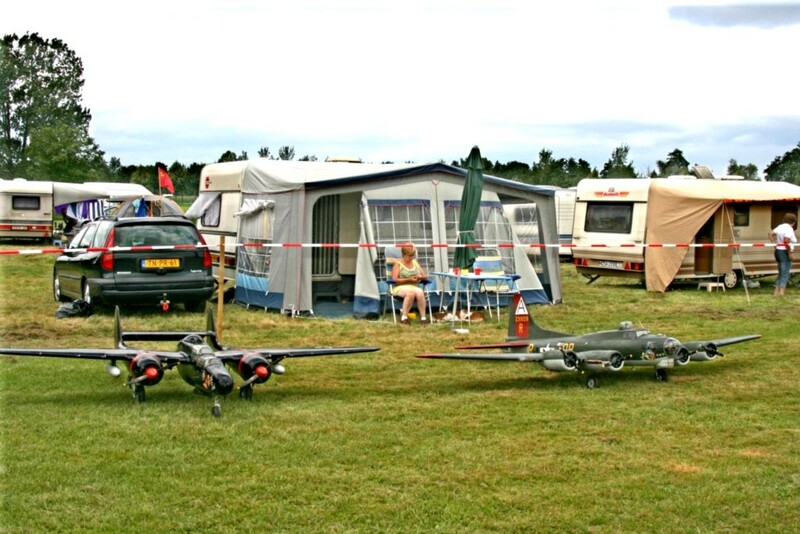 There, at the same day most models of the KLM World Champion Meeting would have their test-flight. I was asked to test-fly the four electric engined Vickers Viscount of a friend of mine, and it flew very well. 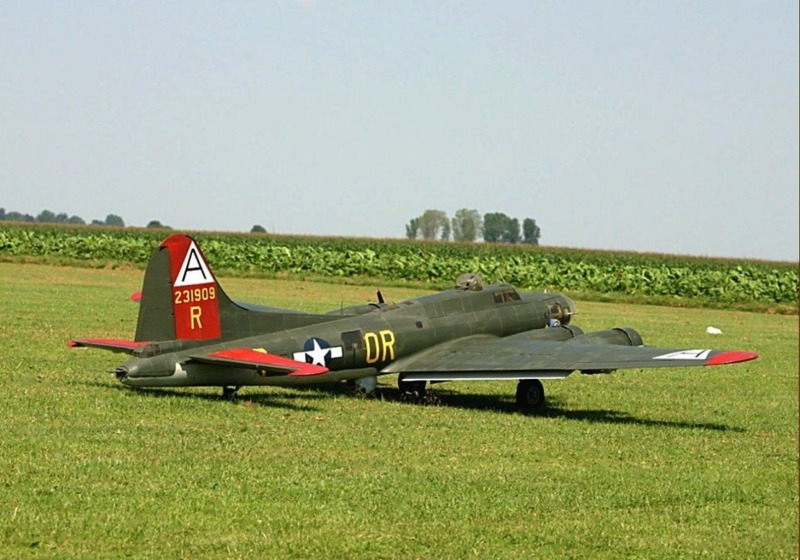 I had the notion that there would be no time left for my B-17, so I decided to drive home to our own local airfield. 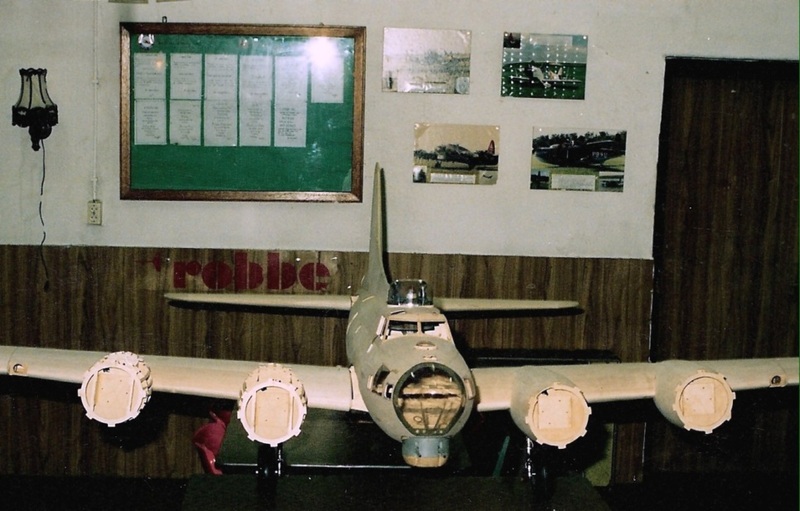 The model was assembled, everything was checked and tested, the engines started, some taxi trials were made and then ‘Nine-O-Nine’ was refuelled, ready for her first operational sortie. As always, there were the same worries! 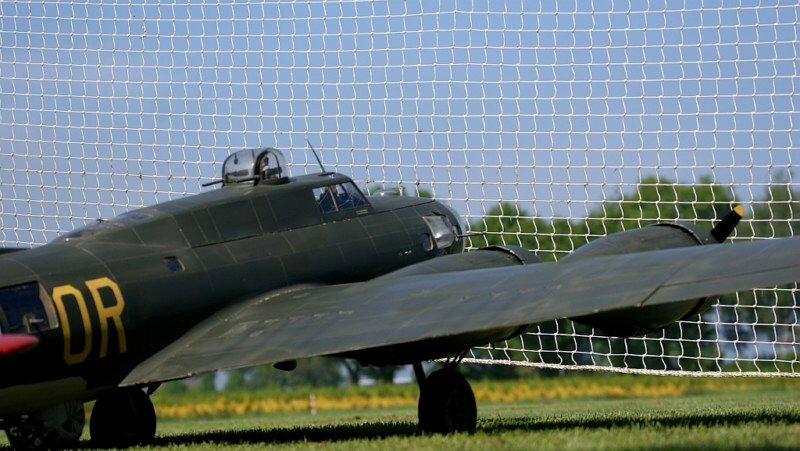 Shall she fly? Incidences and Centre of Gravity correct? 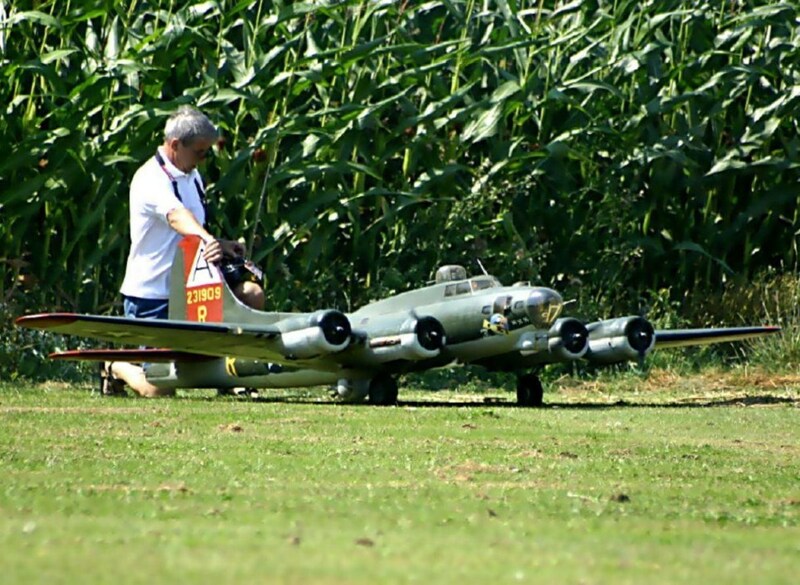 How much will she need fore take off. 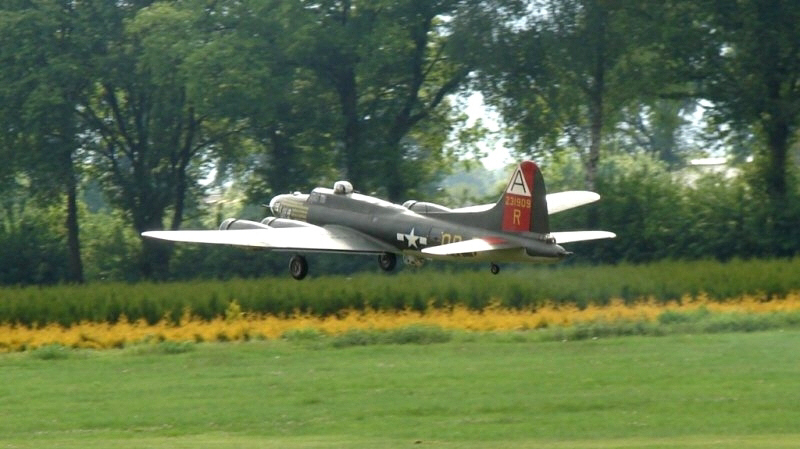 Slowly the throttle control was opened and as was expected, the model started to drift a little to the left. 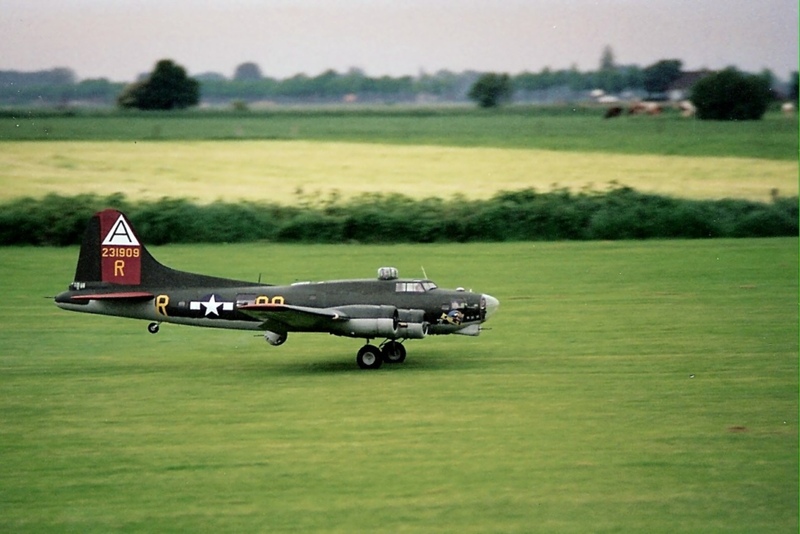 However, the mixer rudder/engines provided instant correction, and the B-17 increased speed as full power was selected, the tail came up and after 40-50m. 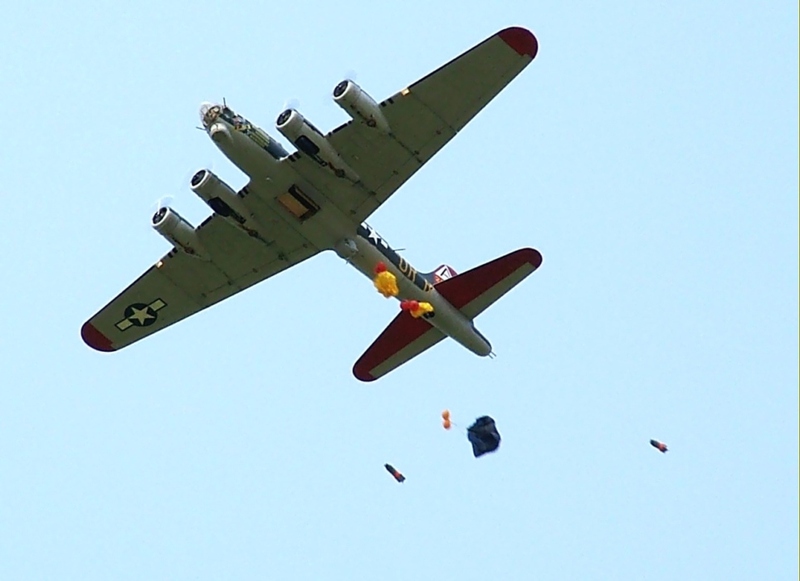 she was suddenly airborne. 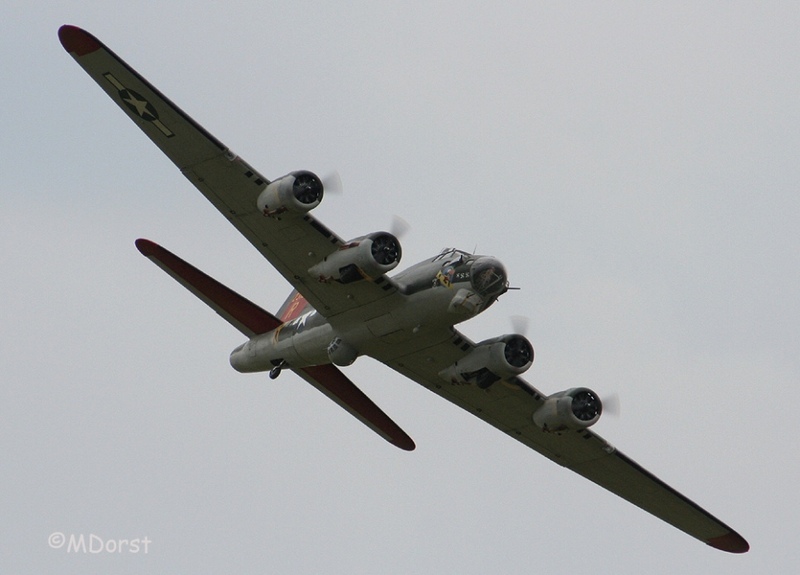 To early, but she climbed away nicely, only requiring some down elevator trim for straight and level flight. 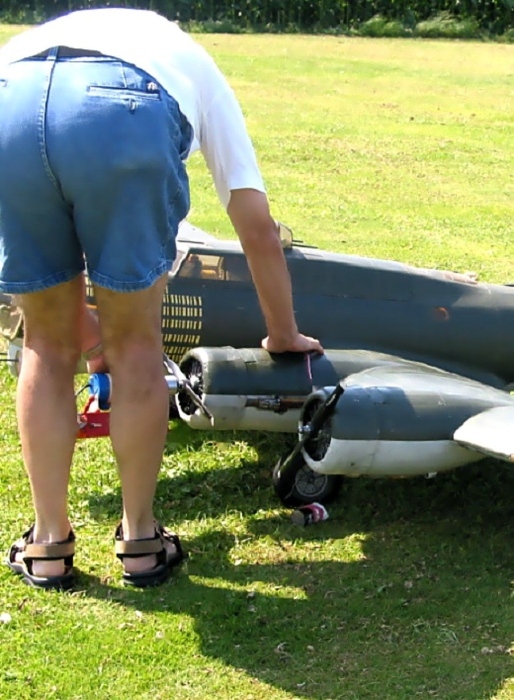 (after landing aIl six batteries were moved more forward, to correct the tail down trim). 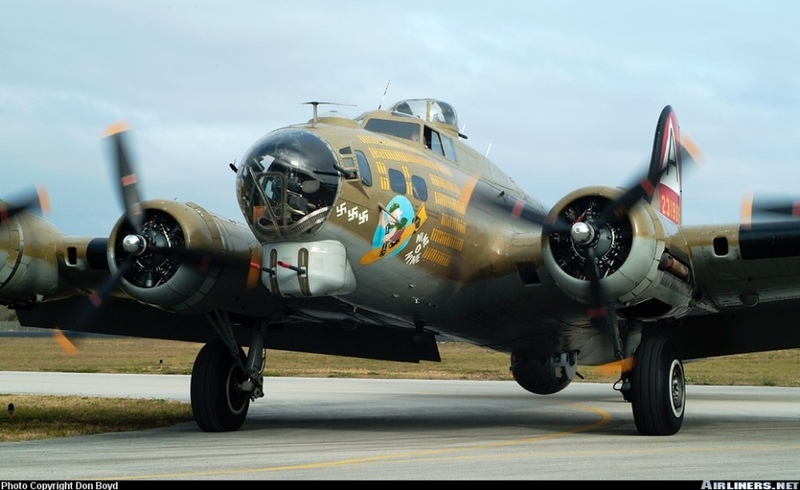 The large B-17 responded very well on all controls, the incidence difference could be a little bit less, but she was a formidable flyer! 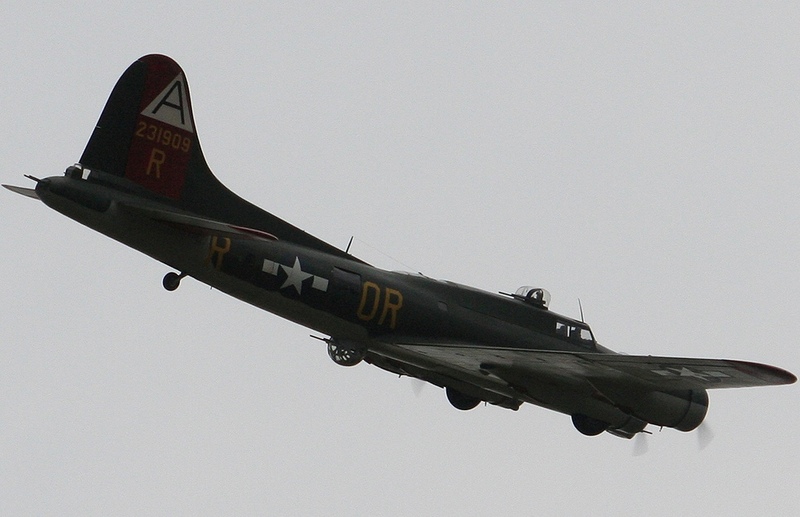 Throttling back to about 2/3rds, with gear up, and there was the 4m. 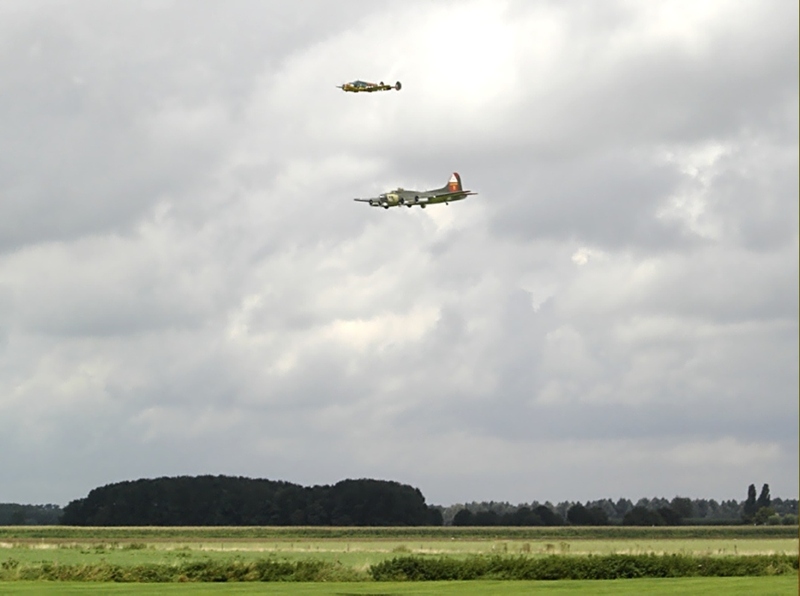 four engined beauty flying slowly and majestically with a deep beat of the four engines, specially in low fly passes, quite thrilling ! 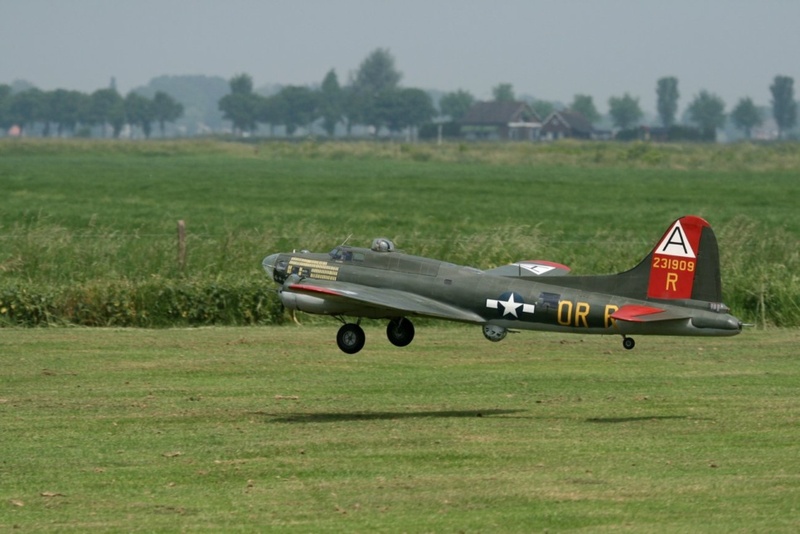 a steady approach was followed by a smooth touch -down and a roll-out (speed a little bit to high, probable due to the 12x7 props, to much thrust!). 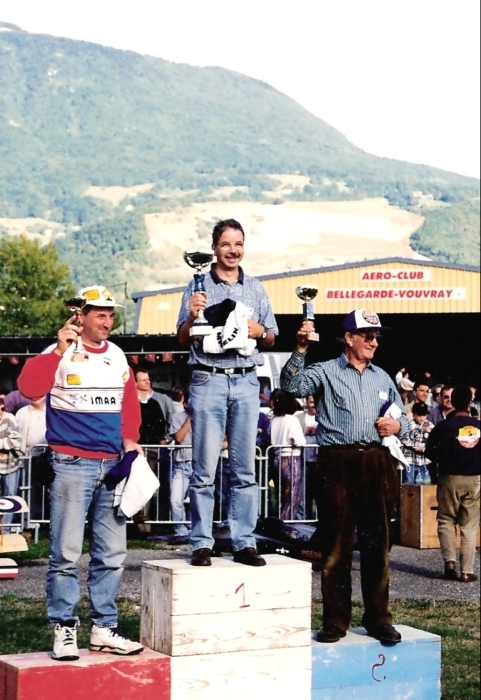 Again I had a very proud feeling! The next day I flew some more test flights, everything was splendid, even all the extra functions: Bomb-bay doors, bomb- and parachute dropping, landing lights, and rotating upper turret. 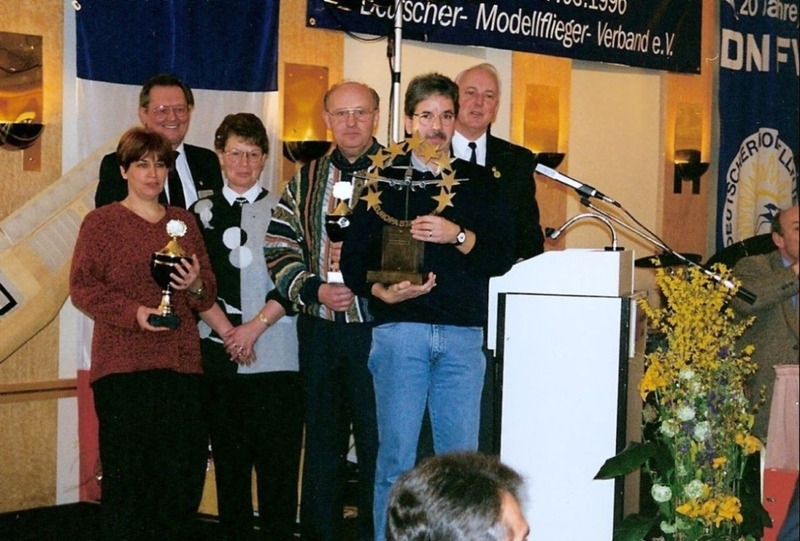 So did not have to worry when I was leaving direction Germany for her first contest ,1994, in the European Star Cup Championships Stand-Off Scale for which you have to fly some contests in different European countries. 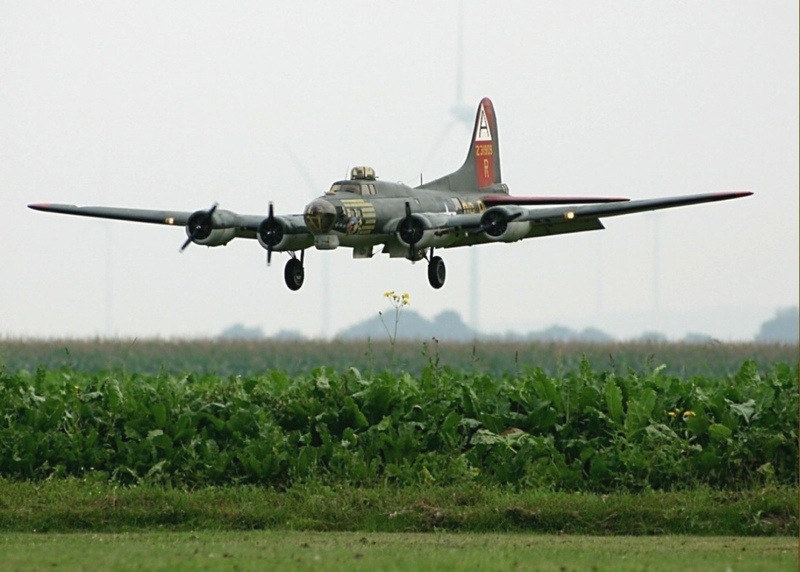 Even bigger was the joy winning this first contest for and with the new B-17, as well static as flying! 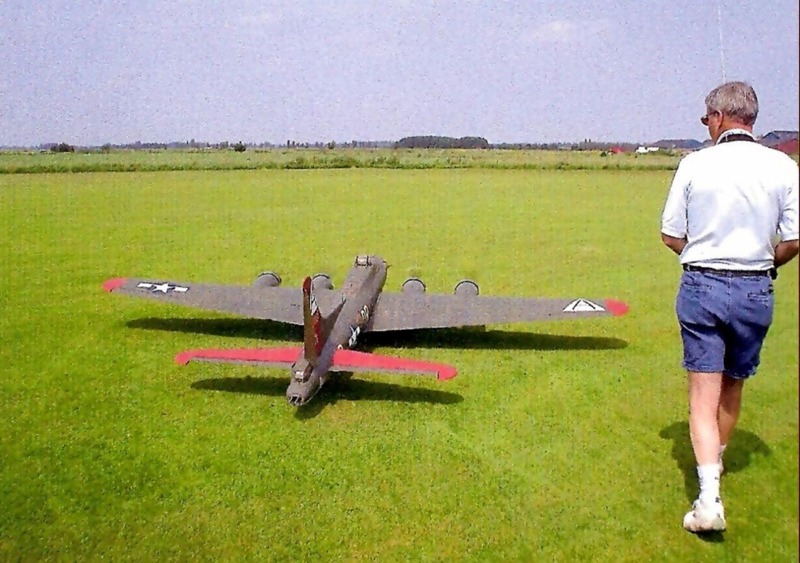 It was and is enjoying, flying this Model, so realistic and majestic! 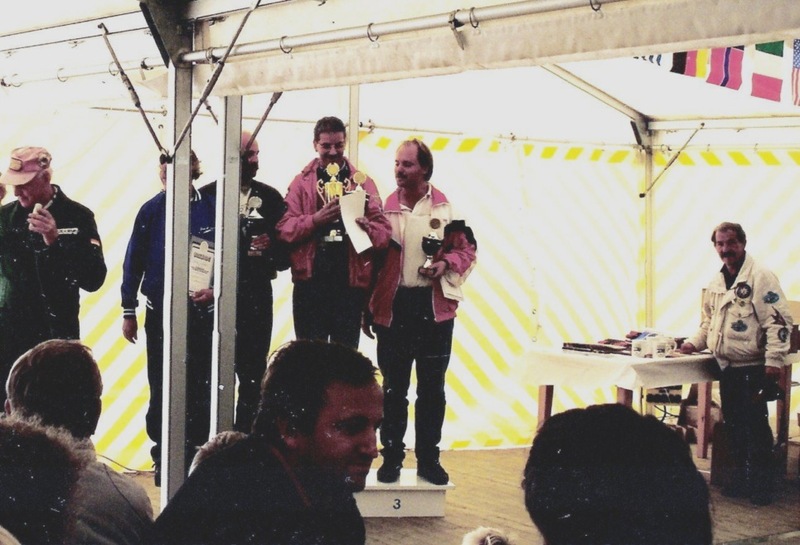 Made many flights and did win over 30 International Scale Contests all over Europe. 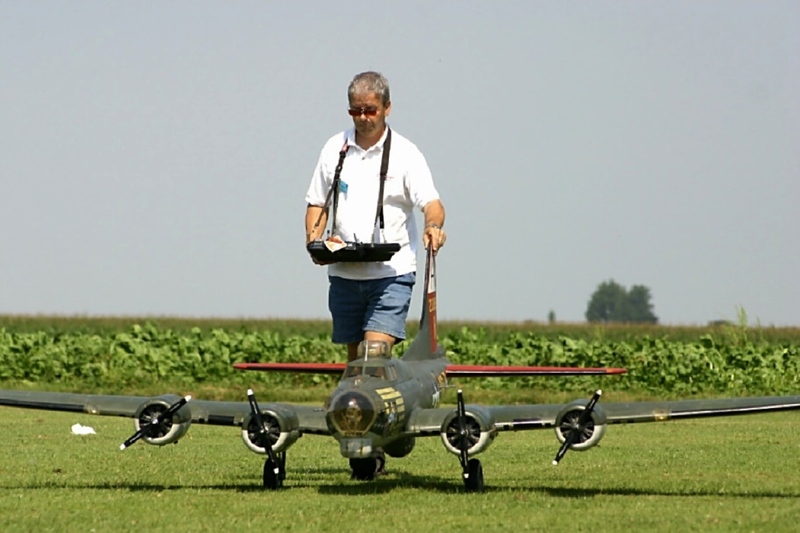 In 2003 I flew my very last Contest, and that was with the B-17, than I stopped competing Contests. 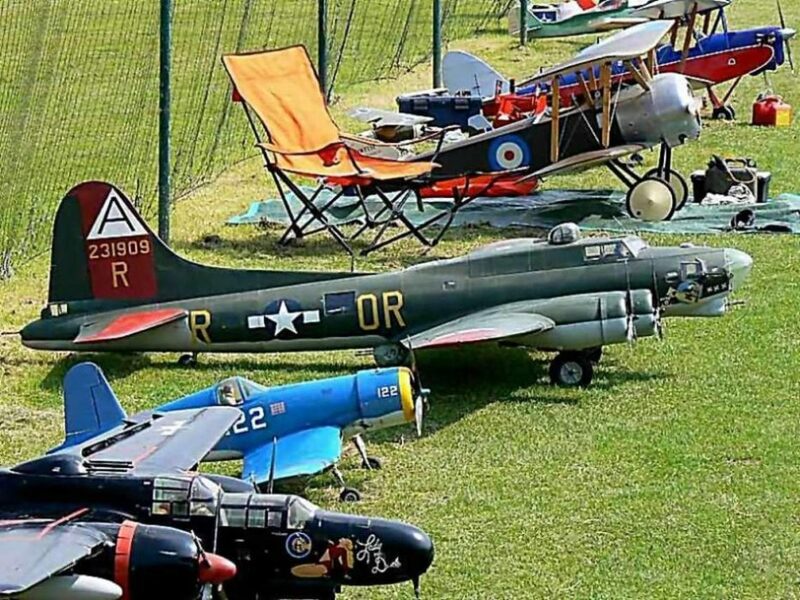 Only Scale & Warbird Meetings. 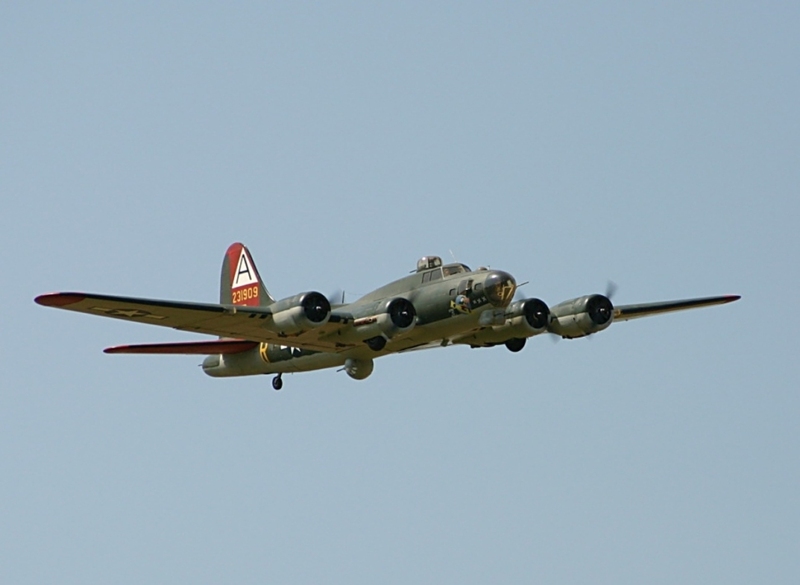 Spring 2007, after 13 years with many flights, I overhauled the B-17. 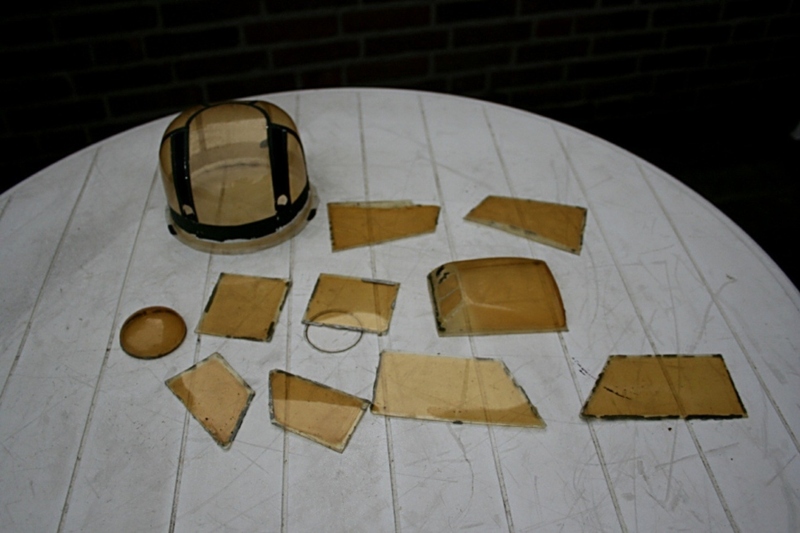 All the Window-glazing, Gunshields, Nose-dome, etc, were yellowed by the sun, so made and formed new-ones and changed them. 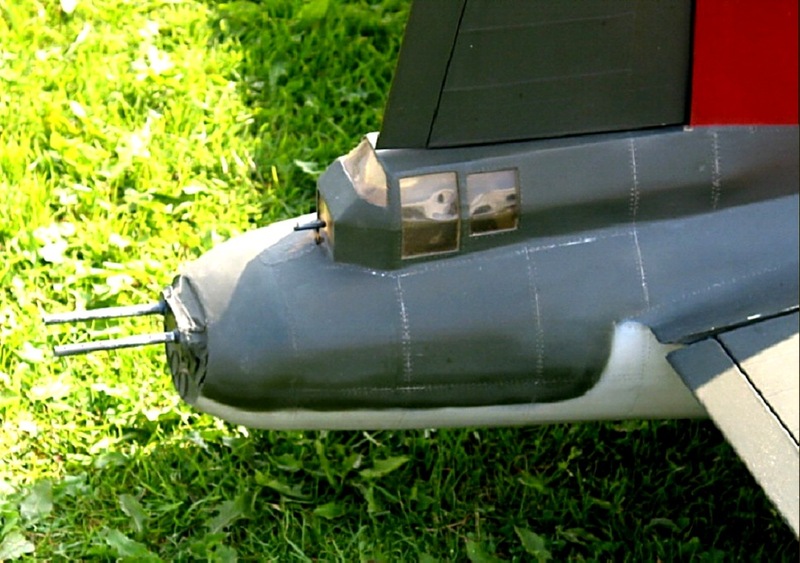 Sanded the Nacelles and the Engine-Cowls (provided them with new and self formed Engine-dummies) and sprayed them again. 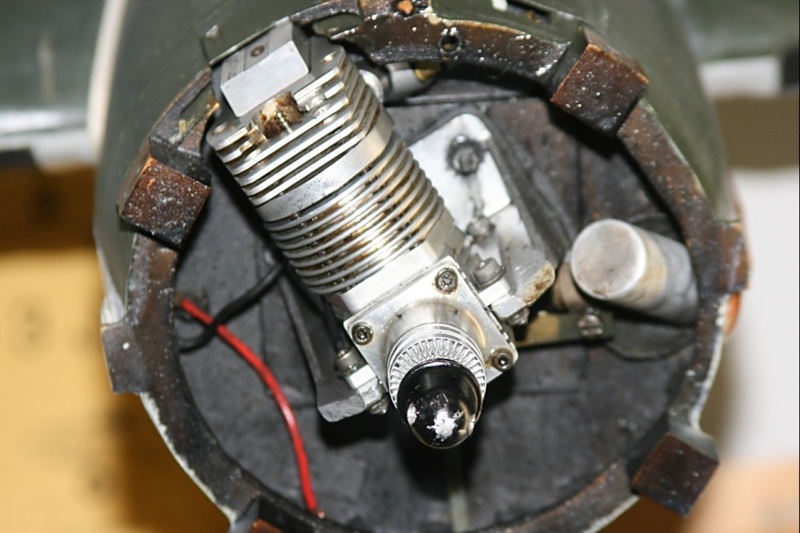 Dismantled for the first time the 4-stroke Lasers 70 entirely, changed some parts, such as the valve-springs and bearers. Dismantled the electric Retracts (own-construction) and remedied the margins. 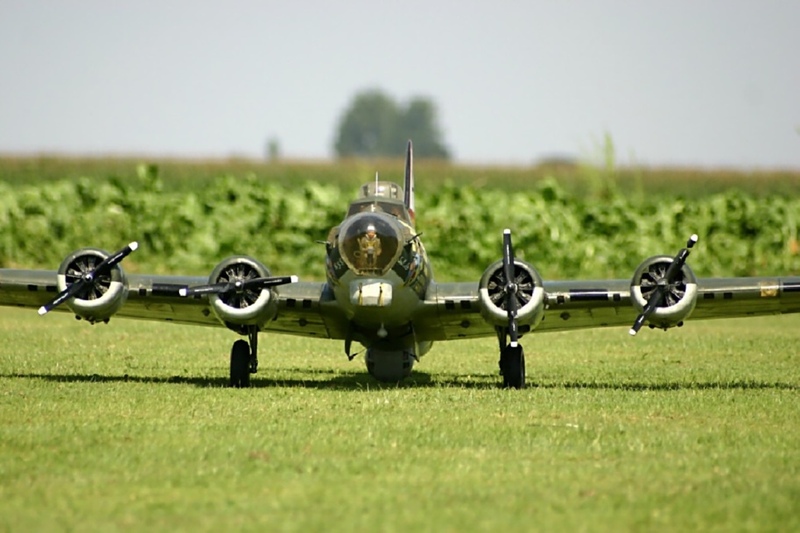 The B-17 was and is the attraction at many Scale & Warbird Meetings, a highly respected guest. She is an old Lady now (22 years old, and over 800 flights! ), and for the time being she will not fly and is hanging on the ceiling. 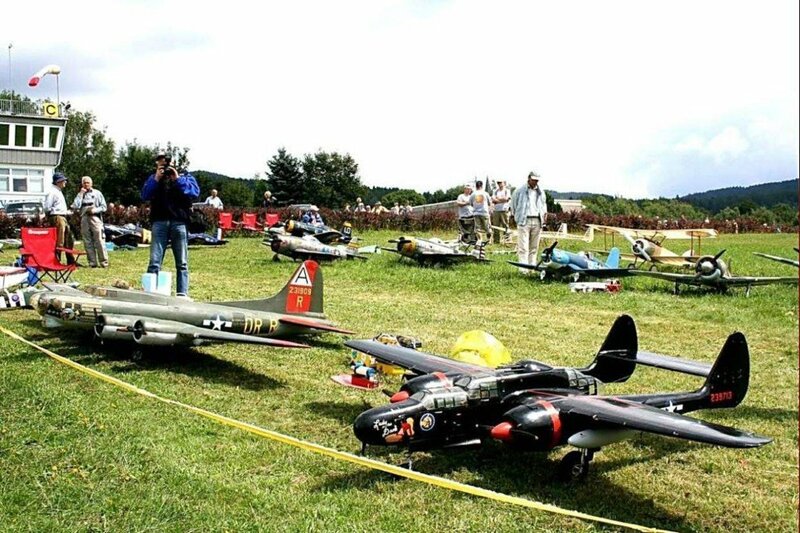 My new Douglas A-26B Invader (span 3,60m = 142") has taken over her role in Warbird & Scale Meetings! 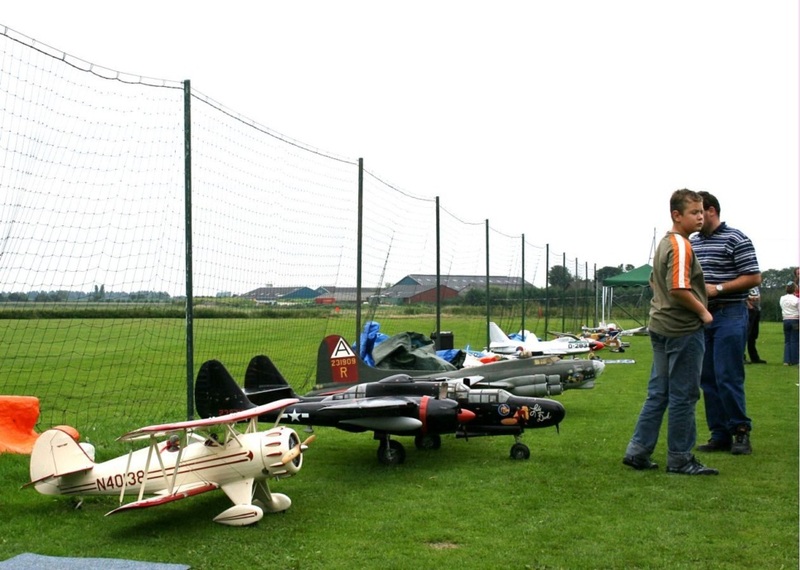 the 4x Laser 70 (11,5cc) engines for the first time. Model or the Real ? 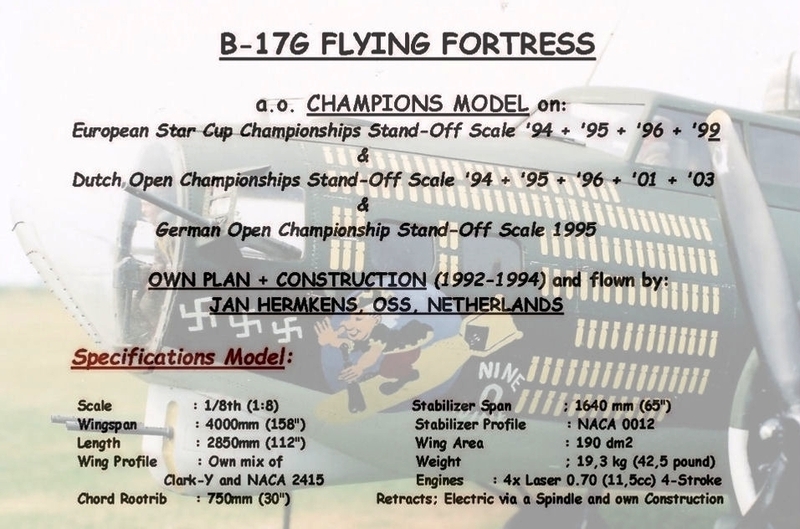 Dutch Open Champion Scale With B-17 in total 5x; '94+'95+'96+'99+'03. 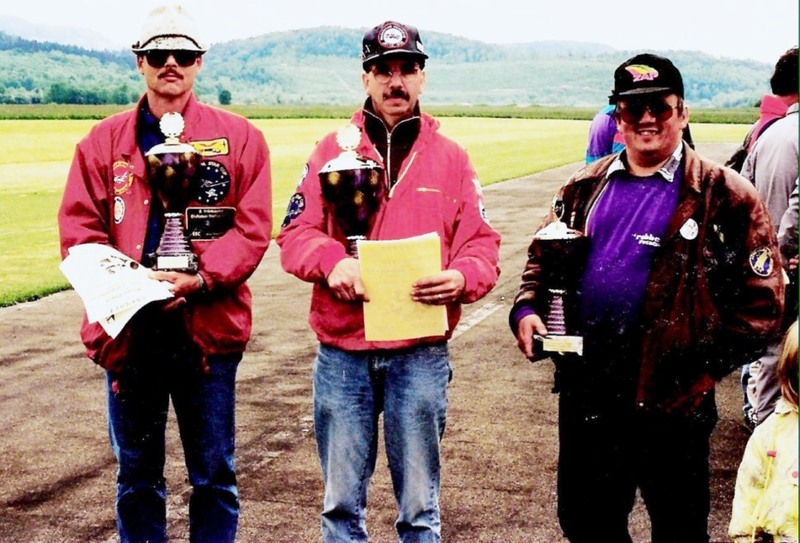 No contests in '97+'98, car accident-injury . 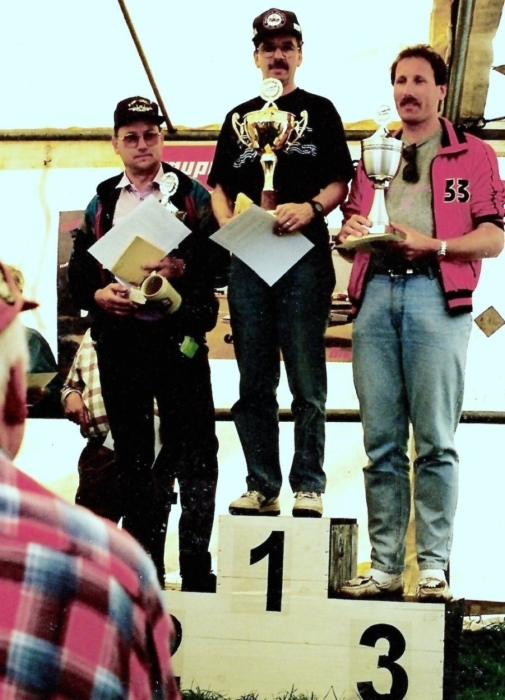 The first and only foreigner ever! 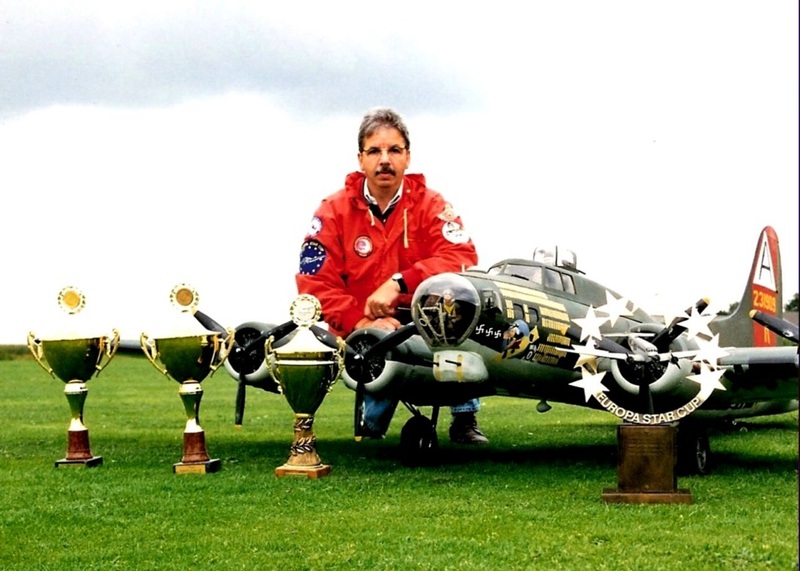 Winner in France, with B-17 (also in '94). 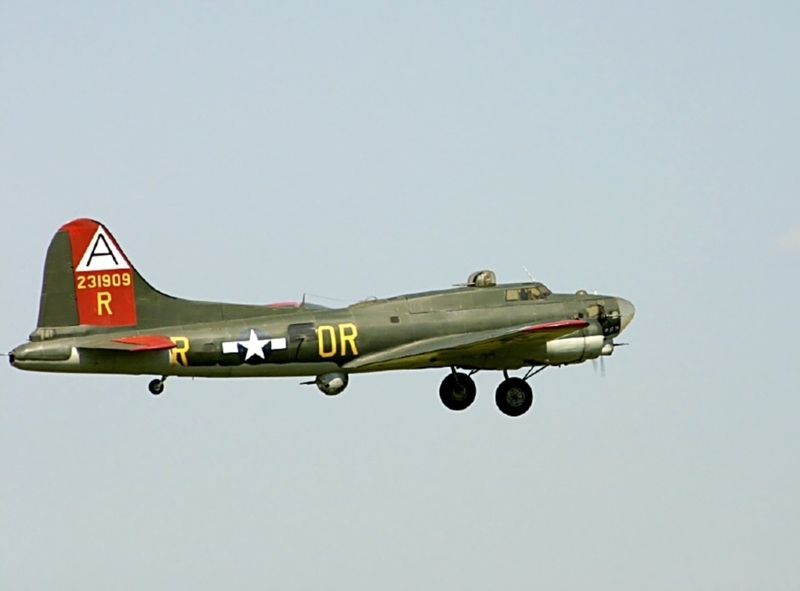 with B-17 (also in '95+'96). 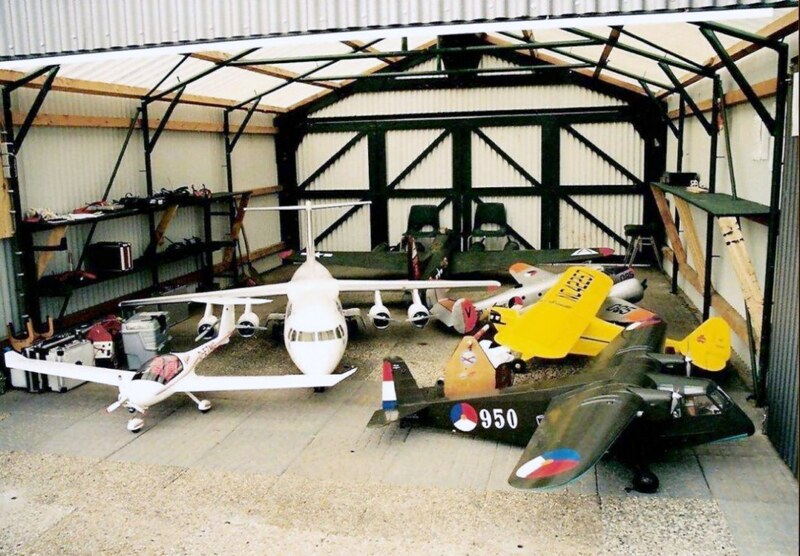 Dutch Warbird & Scale Meeting. 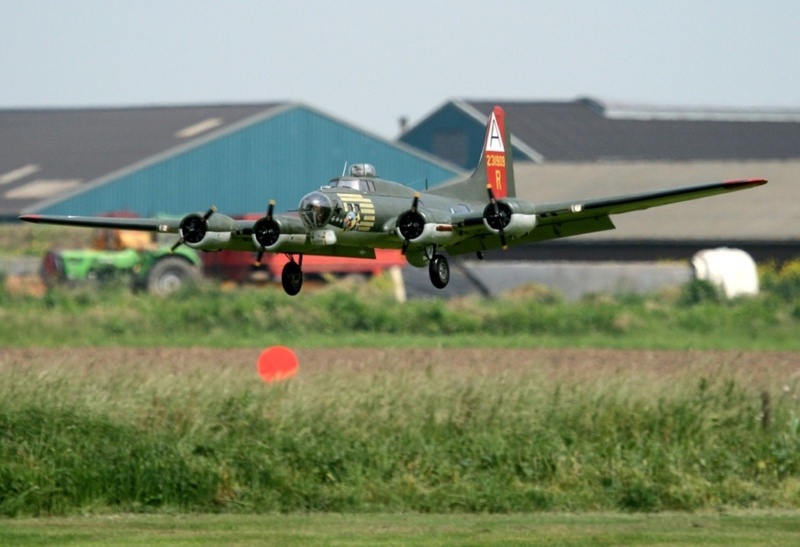 B-17 in full Flight Oss 2008. 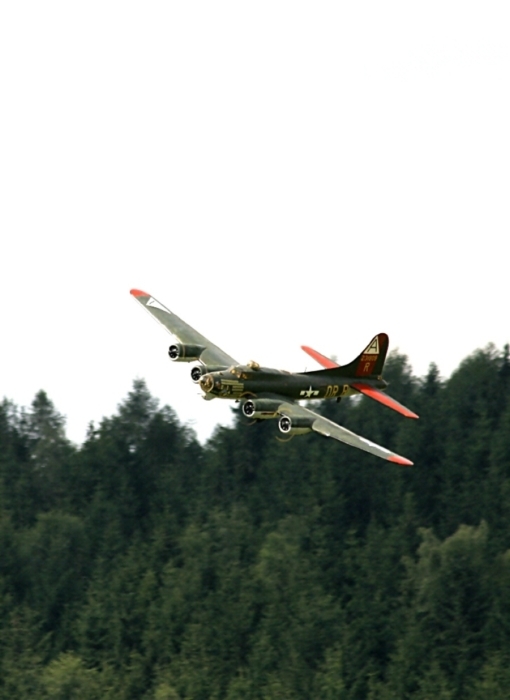 B-17 on Approach 2008 Oss. Eagle has landed Hofheim 2008. 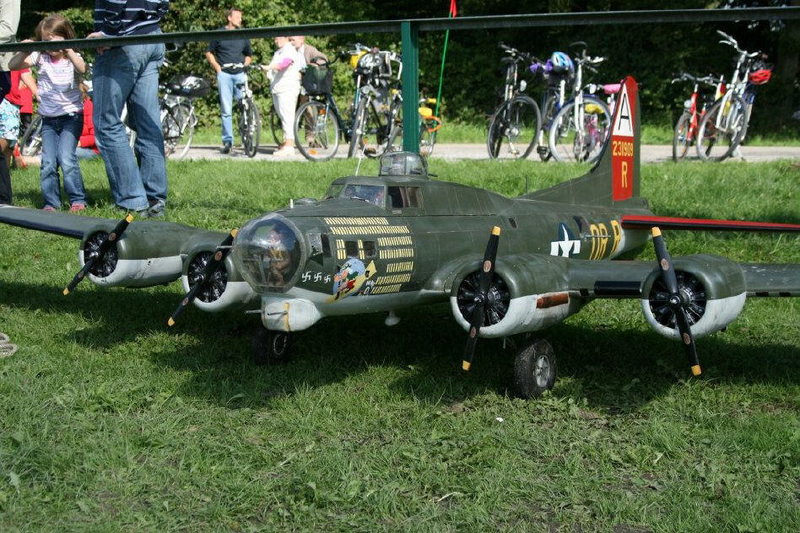 My B-17 + P-61 Hofheim 2008. 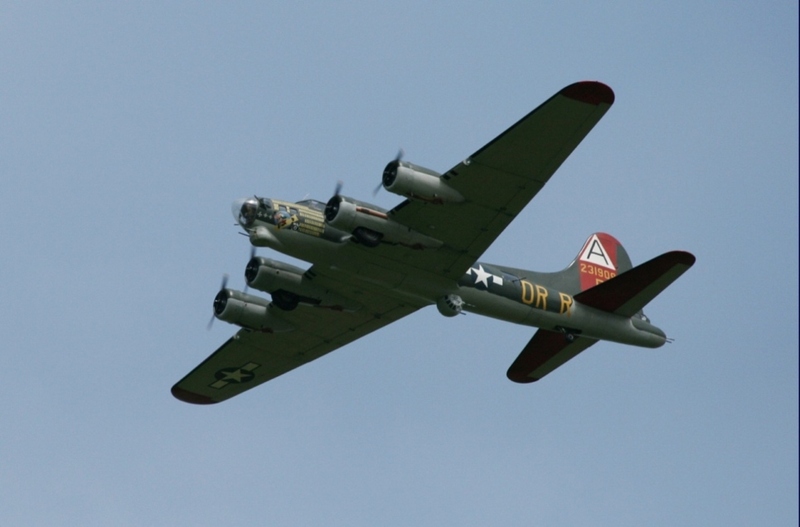 B-17 in Close-up Hofheim 2008. 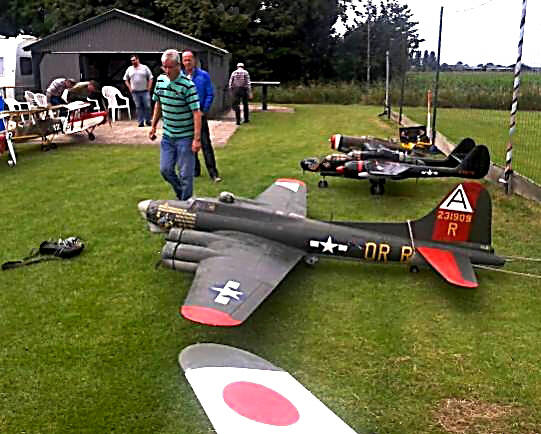 Delta Oss Dutch Warbird Meeting. 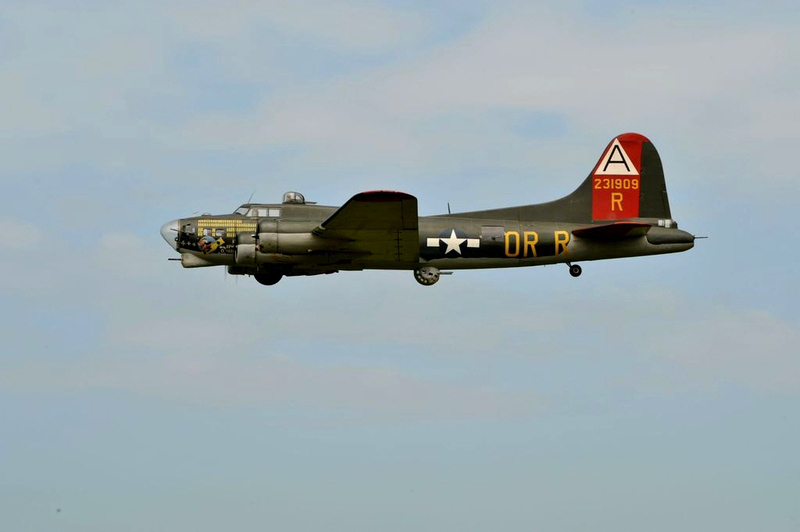 My 24 year old B-17. still hanging on the Celing.